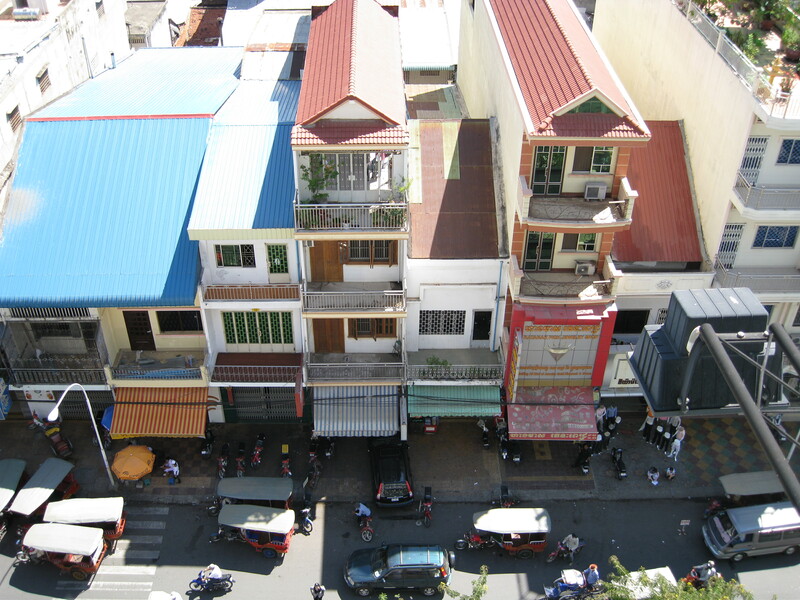 In 2008, whilst I was working in Hong Kong, I arranged to visit some friends in Phnom Penh for a weekend. I caught a flight from HK on a Friday afternoon and was picked up by my friends from the airport. 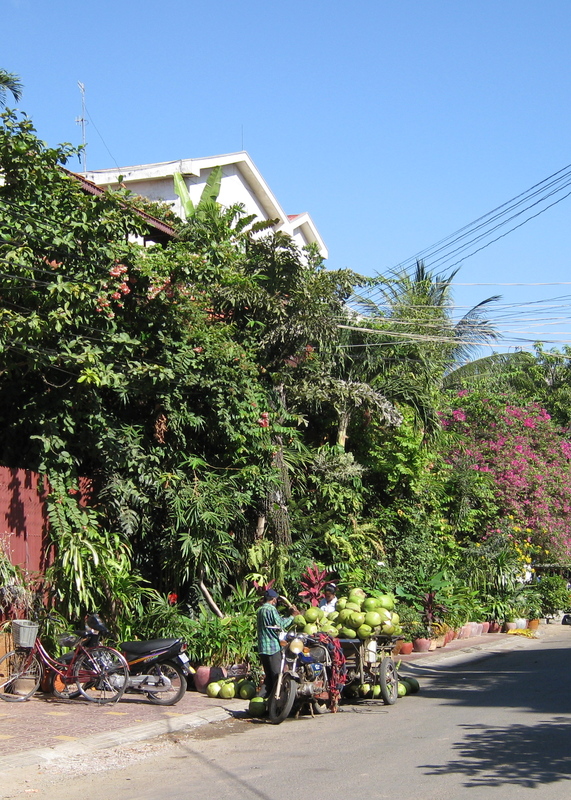 I didn’t really know what to expect but my friends lived in a fabulous [huge] house in Cambodia’s capital and it was interesting to see that the streets around where they lived were all really wide and tree lined…again not knowing what to expect this was a pleasant surprise. 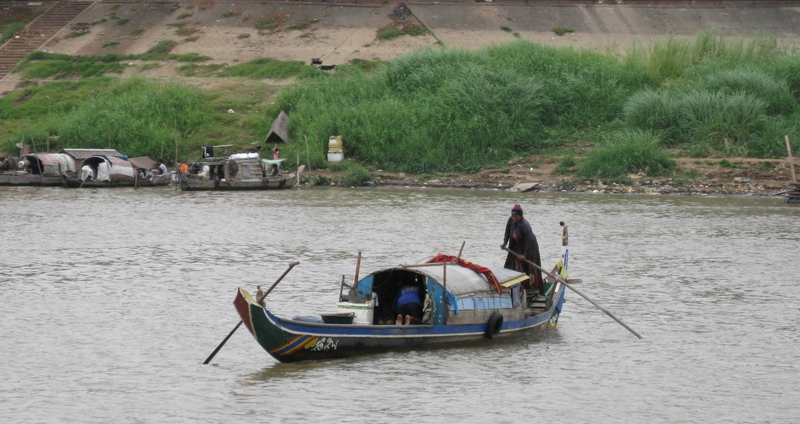 My friends had asked me before I arrived if I was interested in a boat trip along the Mekong River. This is something I had always wanted to do so said a huge ‘yes’. We caught our boat and for about two hours did a tour of the river and being the only people on the boat (apart from the staff) we had a nice time just sitting and relaxing and watching the world go by. The river was pretty dirty and rather sad to see the poverty alongside with families living in tents or small boats alongside the river. But it was an incredible experience to be on the Mekong!!! 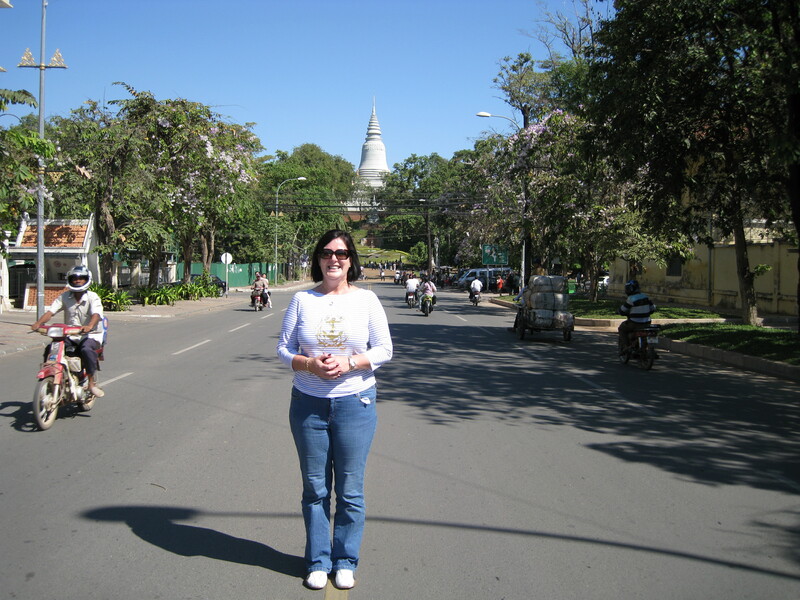 Phnom Penh really is a wonderful city and one I am so glad to have experienced especially with my friends who had lived there for some time and knew the city really well. 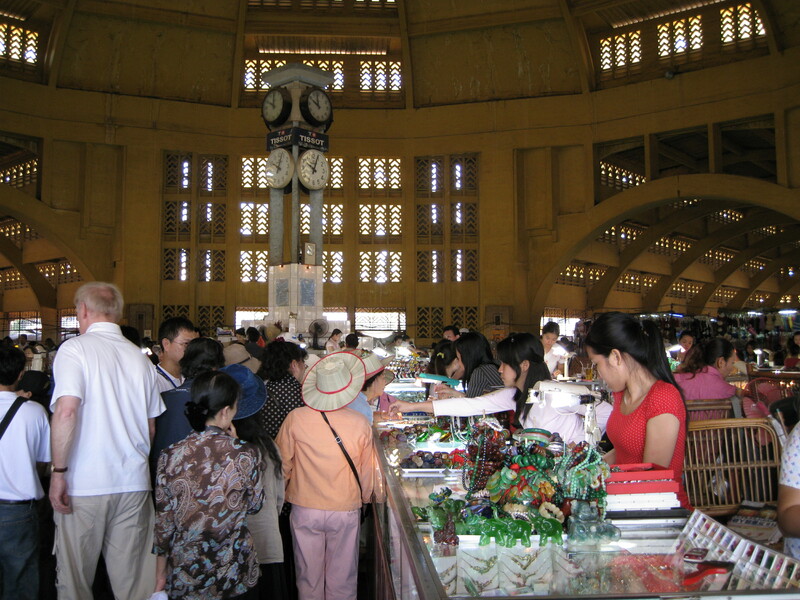 During the weekend, my friends took me to some markets to buy the usual cheap bags/wallets/t-shirts/ornaments and other things which I bought in abundance!! 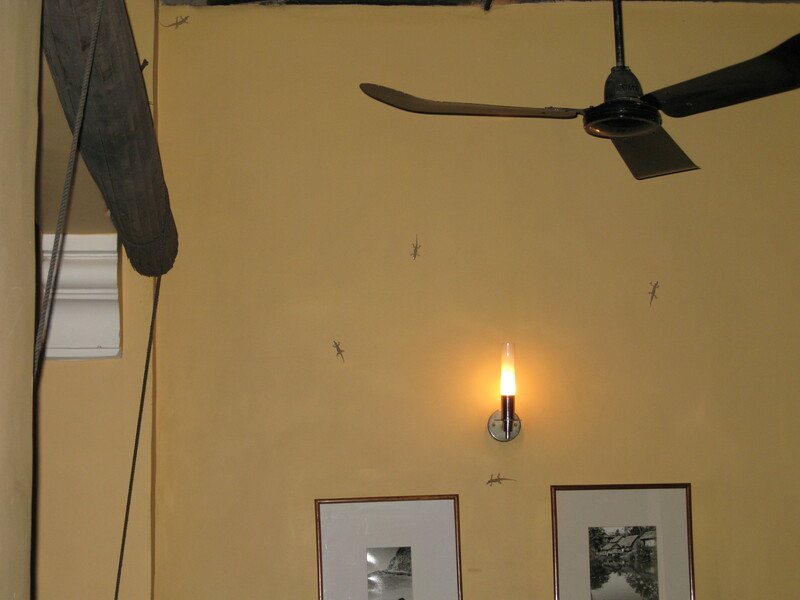 We also went and had dinner at this fabulous little local restaurant which had geckos on the walls…they were on all the walls all around the city inside rooms and restaurants…very cute actually…I liked them. 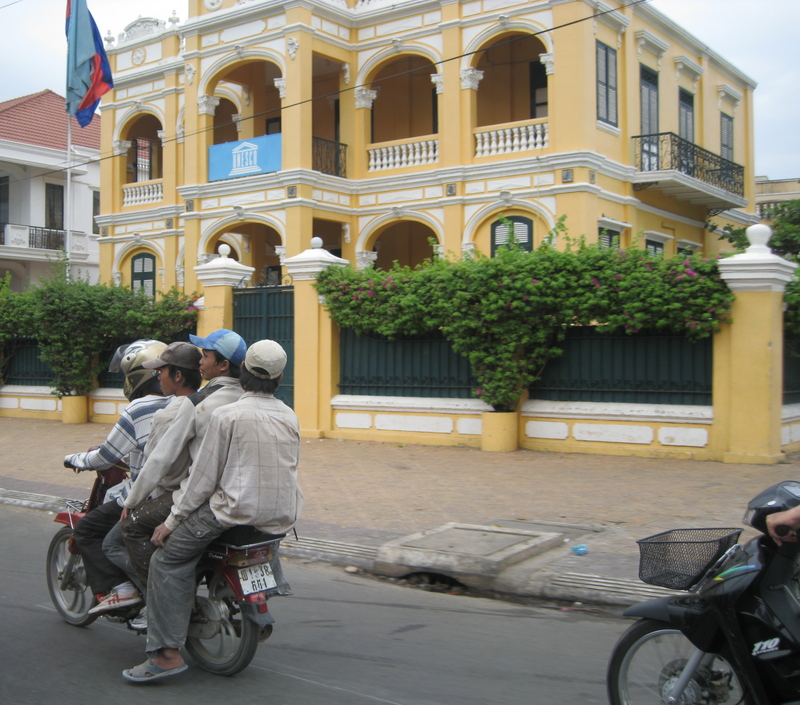 One place we went to which I found really interesting was the Foreign Correspondents Club which was a favourite haunt of foreign journalists when reporting news on Cambodia and located along the Tongle Sap River. 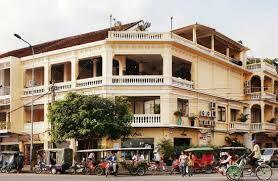 It’s a three storey colonial building and is now a bar/restaurant and hotel. 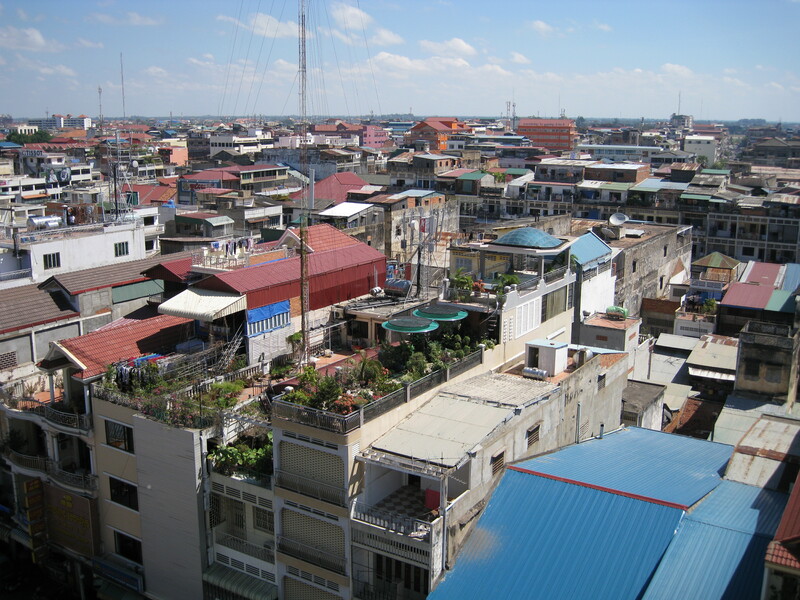 We sat upstairs and had views of the river and the local area…so enjoyable!! Inside there are wooden seats and wooden bar tops and the walls are covered with nostalgic posters. You can imagine foreign correspondents interviewing politicians and others before writing up their stories many years ago. 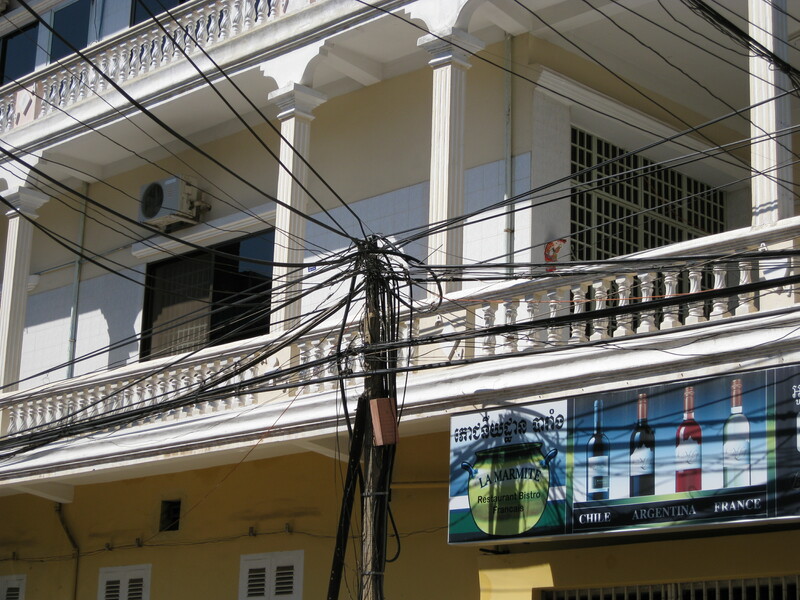 We also had views of the cluttered power lines that are generally seen all throughout the majority of Asia. And my final stop on the Sunday before I returned to the airport to go to Hong Kong was to see Wat Phnom, a buddhist temple built in 1373 and is the tallest religious structure in the city. It was so hot walking around the city [so hot] but it was lovely to see the places I did see. 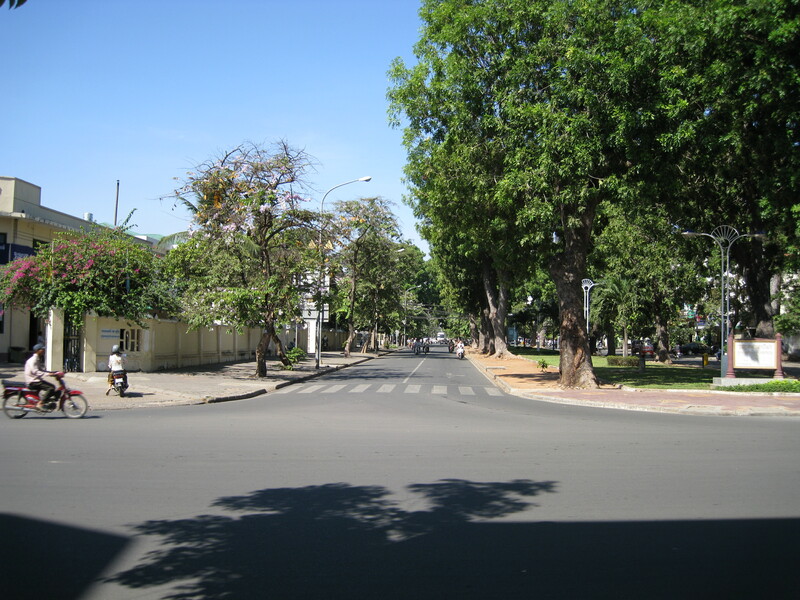 I know I didn’t see everything Phnom Penh has to offer but what I did see was lovely and I really enjoyed spending time with my friends Mike and Jude. 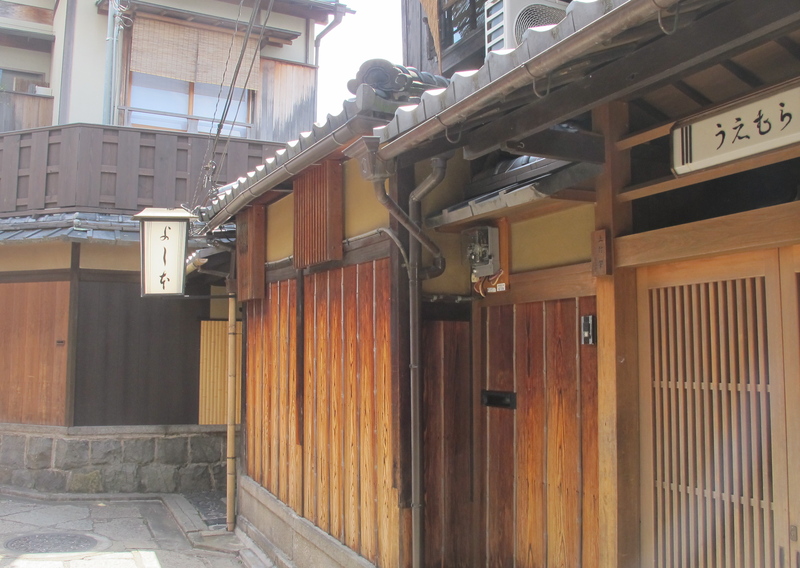 Ishibei-koji is regarded as Kyoto’s most attractive street. 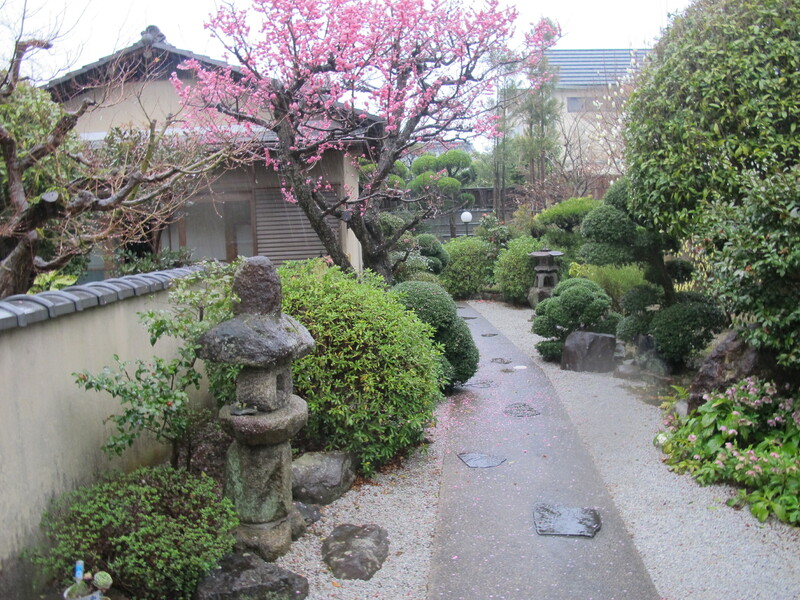 And it truly is lovely (like everything else in Kyoto really). I suppose to me it was more a little lane-way than a street, and it’s for pedestrians only which is wonderful as you can stroll along enjoying the ambience and enjoying everything it has to offer. 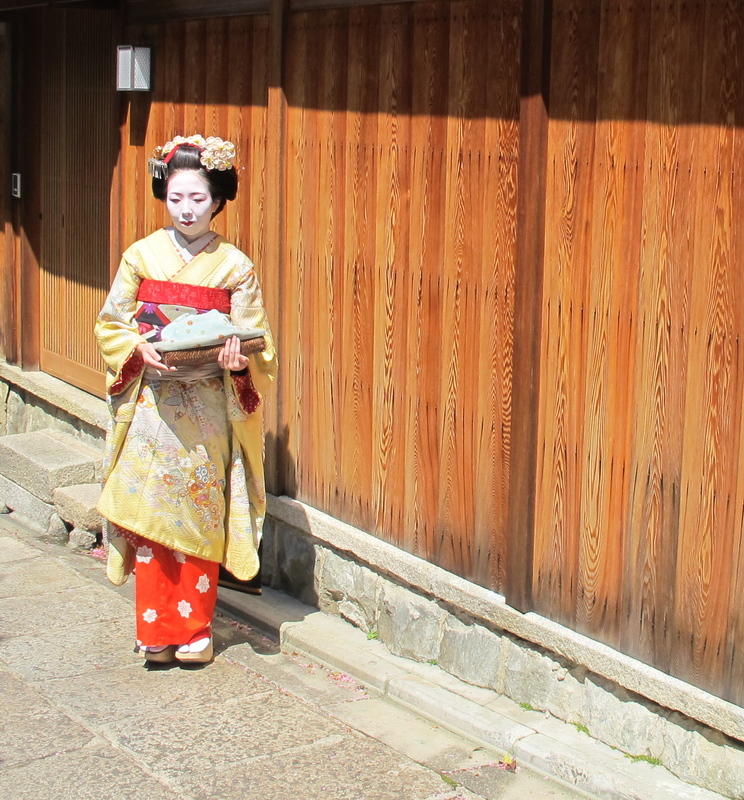 Along the street, which is only about 200 metres long, I saw several Japanese women in their traditional garments; the kimono – all so different but equally beautiful. 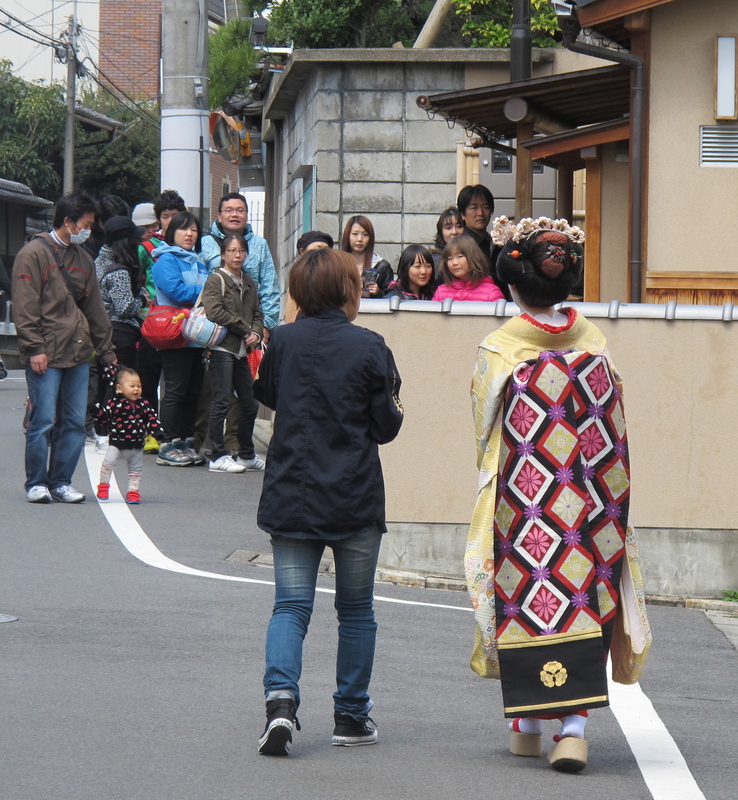 And it’s not only the visitors to Japan who love to see the Japanese women in their traditional wear, the Japanese love to look at them too. 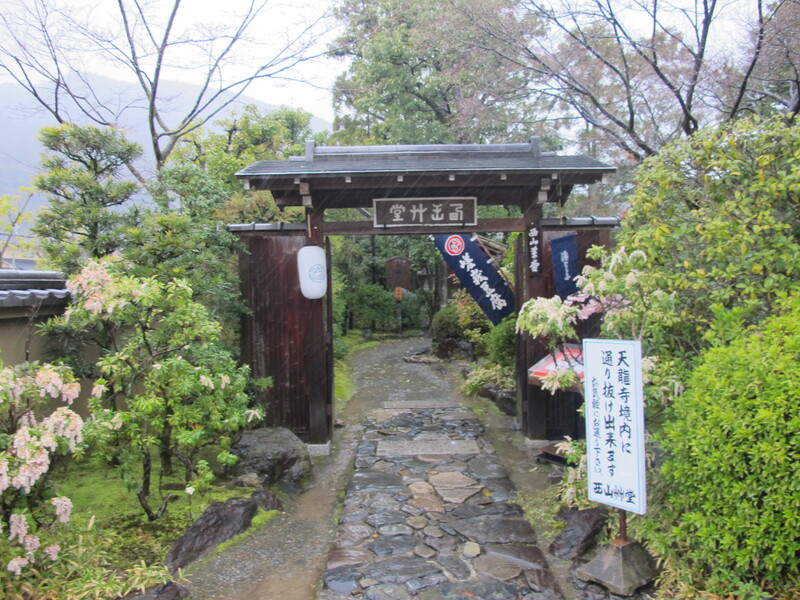 We stopped at a gorgeous little tea house and enjoyed a cup of tea and I just loved the entrance to the tea house and the inside ambience – fresh flowers on the tables and wonderfully friendly staff (who could not speak English but we worked it out). At the entrance to Ishibei-koji (which is a little difficult to find as the signs are only in Japanese) there are rickshaw pullers who congregate waiting for their passengers. 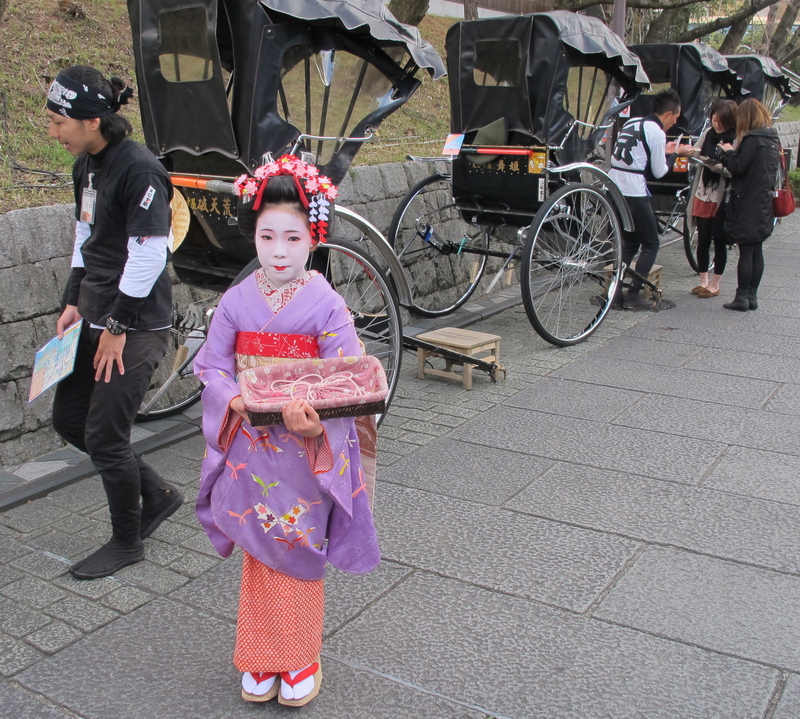 One the day I went, I saw this absolutely gorgeous little girl dressed in traditional Japanese clothing – she was ‘so cute’ and her mum and she allowed me to take her photo. I think you will agree she is beautiful. 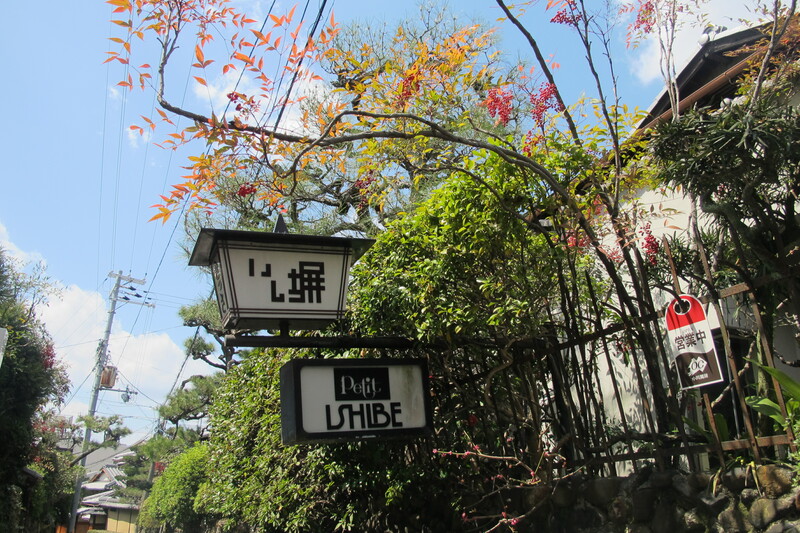 Along Ishibei-koji, you’ll find nothing modern – only beautifully maintained traditional inns, restaurants and elite bars. The lane twists and turns a few times and at every turn there is a beautiful doorway leading into a home or restaurant etc. 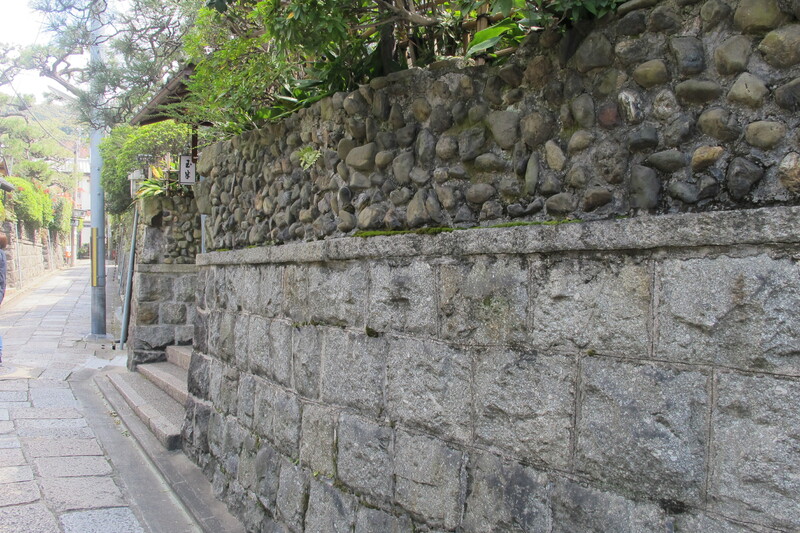 Ishibei literary means stone moat. 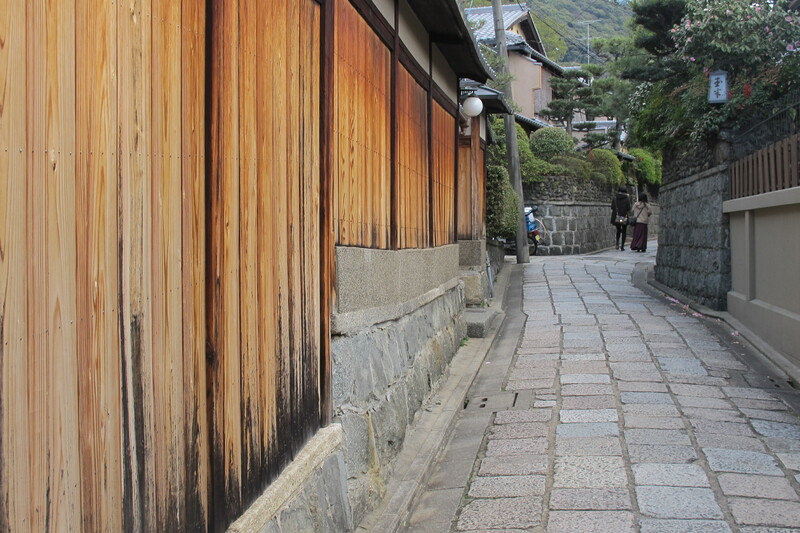 Because the houses on this street have beautiful stone walls, it was named ‘the narrow street with stone walls’. 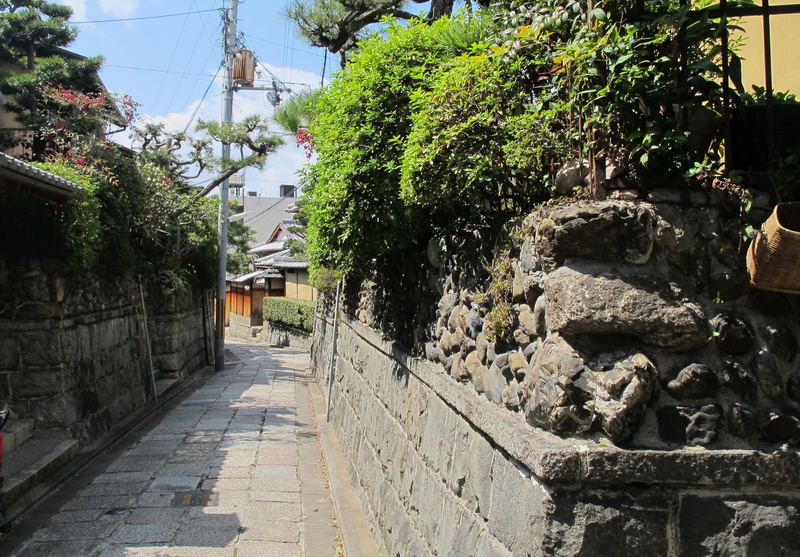 There are also beautiful flowers lining the street and along the tops of the stone walls. 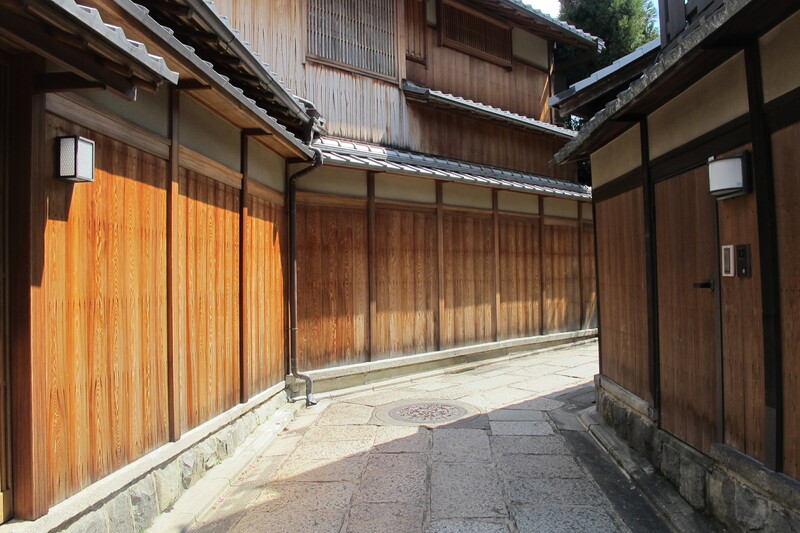 Another part of Kyoto which was truly beautiful. I couldn’t believe it when I heard there was a Ball on the Wall…but I knew I had to go. 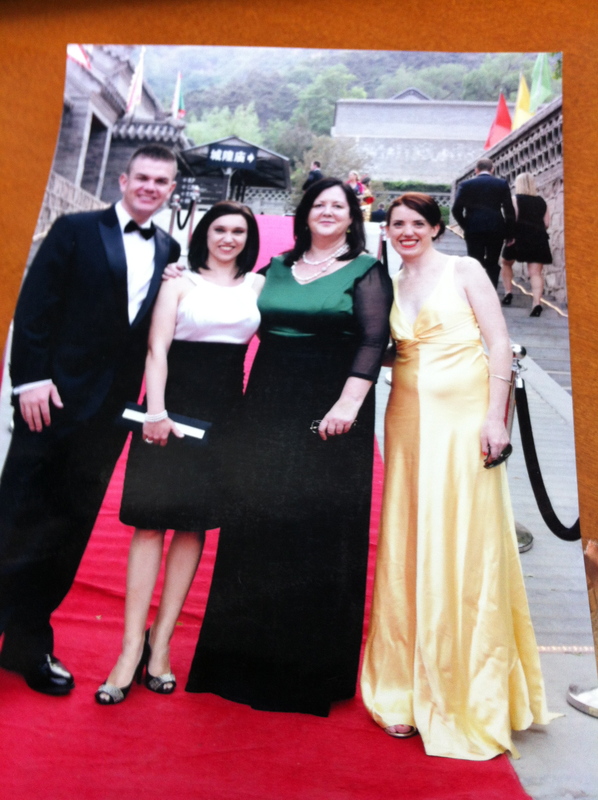 The Australia New Zealand Association (ANZA) hosts a black tie event on the Great Wall of China every year in May. In 2013, with some friends who were visiting me from Singapore, we hired a car, got all dressed up and attended this fabulous function. It’s pretty difficult to buy tickets, as this is such a popular event so you have to get on the phone the minute the lines open and purchase your tickets. You have to be a financial member of ANZA and this entitles you to bring one guest. Every year the ANZA committee identifies children in local orphanages and foster homes who are in need of life-changing surgeries. During the evening there are many raffles with fabulous prizes and the funds raised through this raffle enables these surgeries to go ahead. A really worthy cause!! 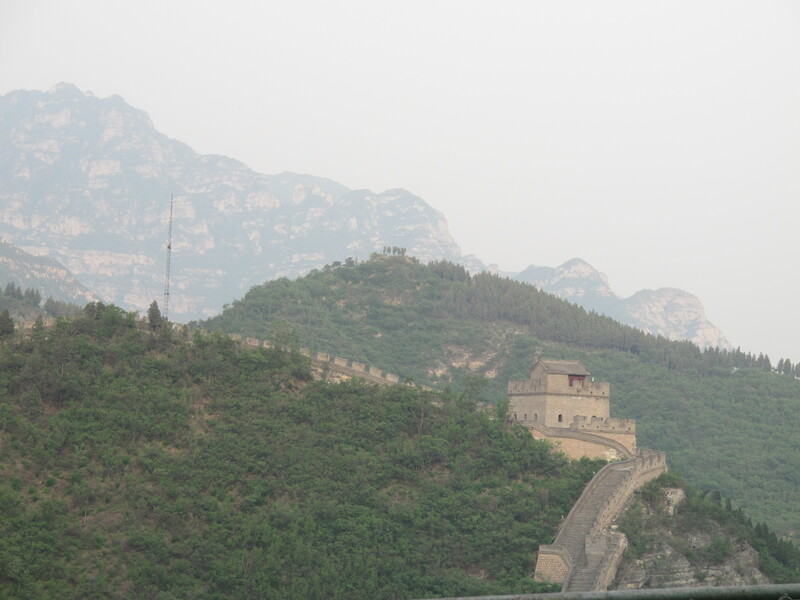 The Ball is held on one of the passes at the Badaling Section of the Great Wall which is about an hours drive north of Beijing. The evening starts off with your photograph being taken on the red carpet as you enter. It’s lovely to see everyone all dressed up ready for a wonderful evening. 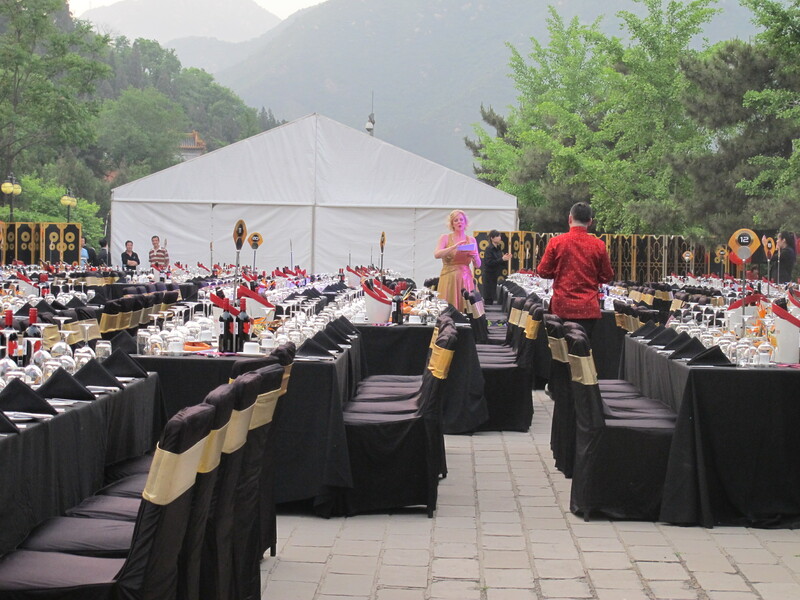 After your photo you walk up some steps (always steps in China) for pre-dinner drinks, and then you find your allocated table and enjoy a meal followed by lots of dancing and lots of wine. 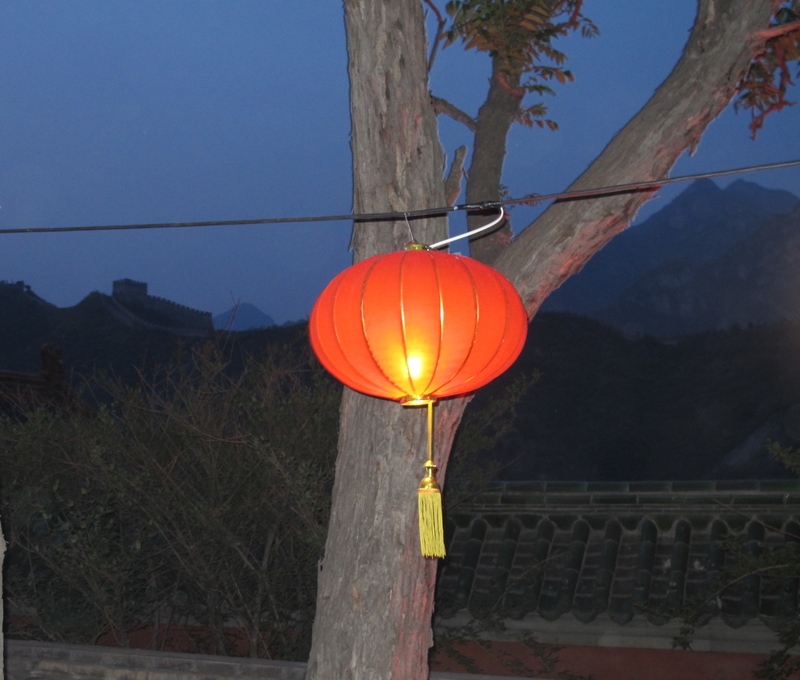 The surrounding area is lit up with lanterns which is lovely in the daylight and then the lights on the Wall are illuminated at night which makes viewing the Wall very special throughout the night. It’s something very special to do whilst in Beijing and all my Aussie and NZ friends who have lived in Beijing have attended. A wonderful evening for a great cause (and unfortunately I did not win any of the raffles). 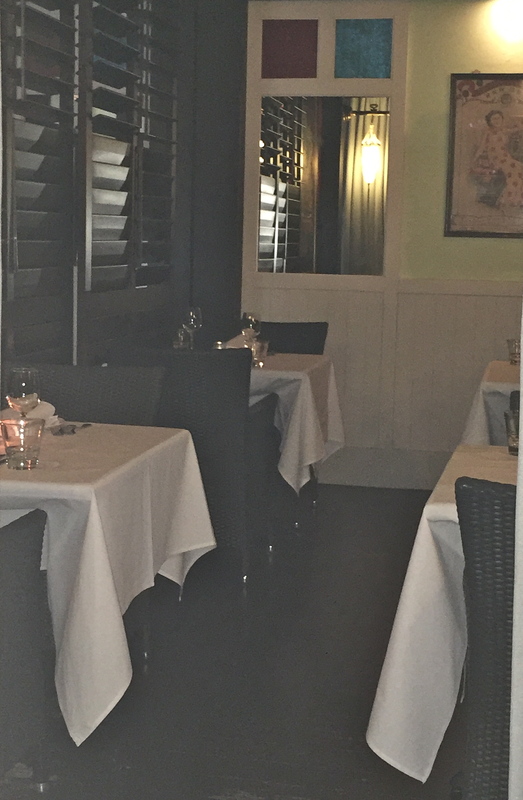 It was one of my friend’s birthday last week so I chose the Lanterne Rooms which opened in 2008 in one of the lovely leafy suburbs of Canberra. 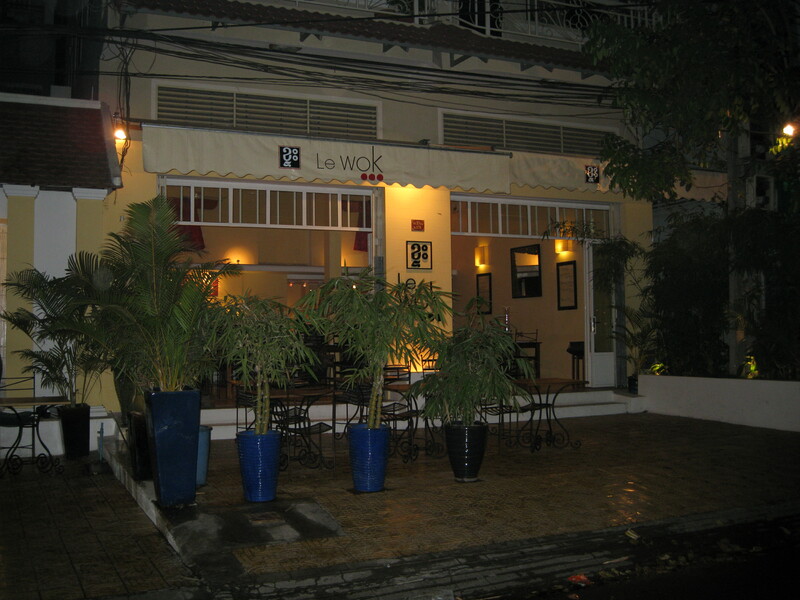 I had heard wonderful things about the restaurant both about the service and especially the food. I was not disappointed with either. For my friend’s gift, I bought her a lovely smelling candle and matching reed diffuser…she was very happy even before we started eating and this friend is a huge ‘foodie’; she loves good food at nice restaurants. 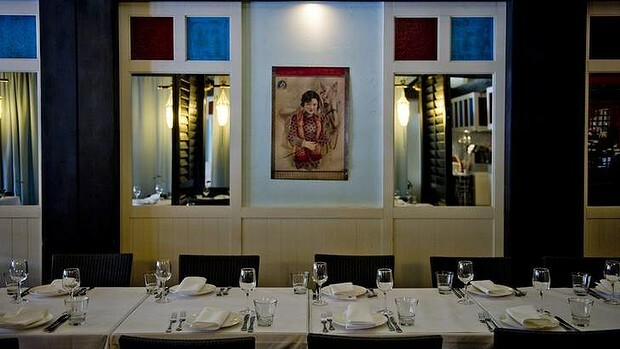 As soon as you walk in you feel like you are transported into a rustic Malaysian farmhouse; white washed walls, dark wood flooring, the blues and reds of South East Asian styled stained glass panels line the walls. The food has a Southeast Asian flavour; probably a little more Malay. I ordered from the menu and my friends all ordered the tasting menu which meant they had about eight dishes each and I ordered two entrée and one main (which I ended up sharing with my friends as the meals were rather filling). I ordered the crispy tofu and eggplant with roasted tomatoes and black sesame dressing, the spiced cassava with mantau bread and the Shanghai rice noodles with vegetables and dark soy. 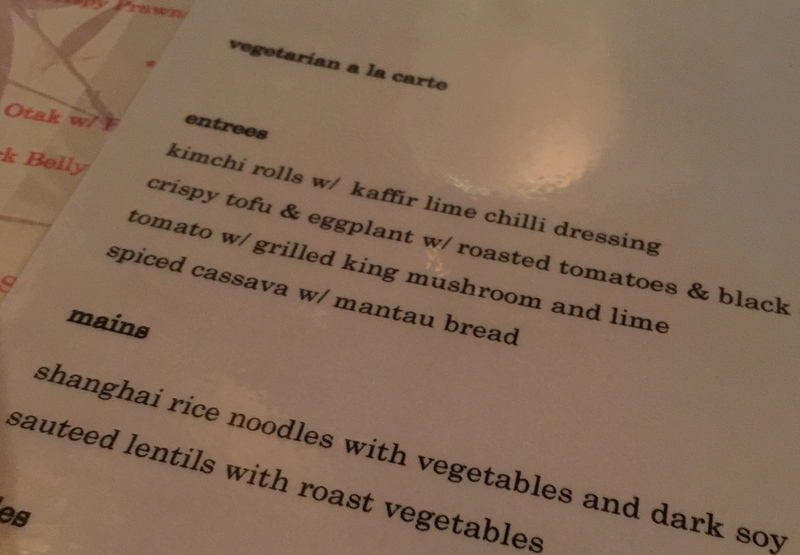 I had no idea what cassava was but was informed it is a root vegetable [and was delicious]. The Shanghai noodles were incredible…took me right back to China eating fresh noodles…so good to eat. My friends all said their meals were absolutely delicious. 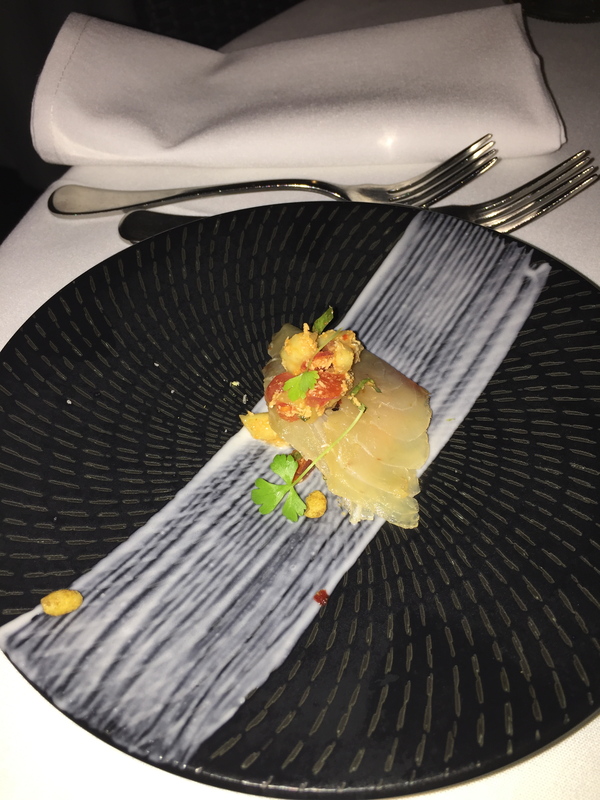 They started off with the cured kingfish and tomato salsa followed by tomato with grilled king mushroom and lime. 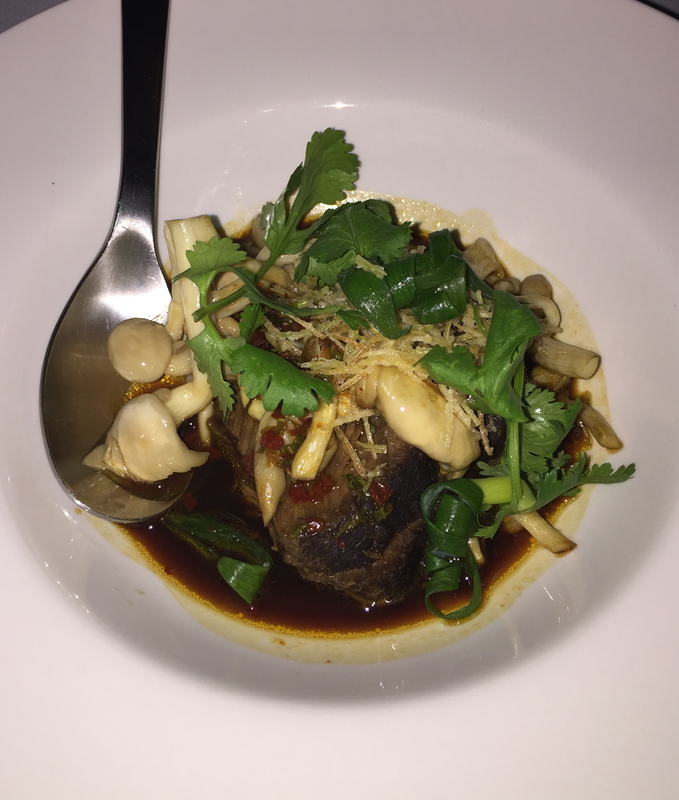 This was followed by a palette cleansing sorbet then the Penang hawker style satay skewer and the slow braised beef cheek in an Asian herb broth (all said this dish was delicious). 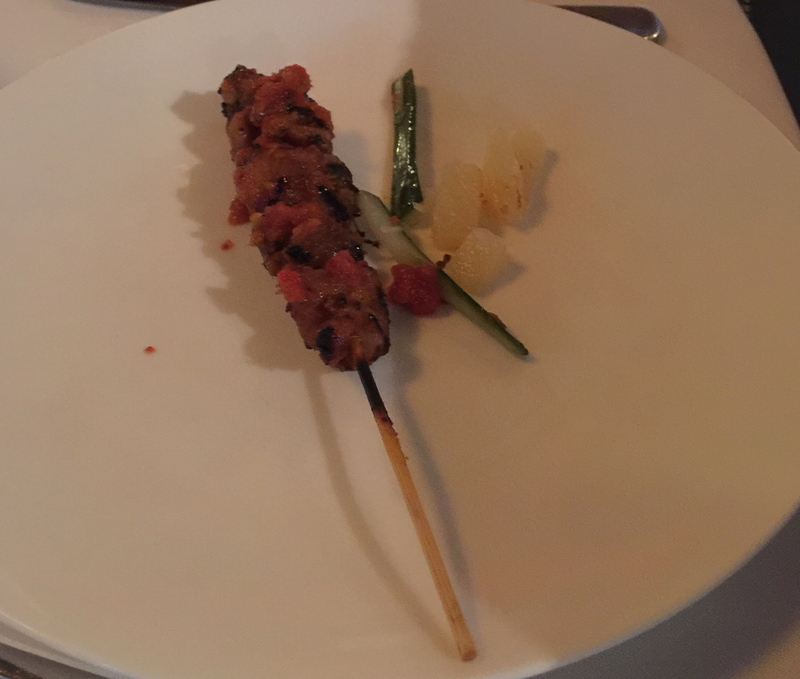 Whilst the photo of the satay skewer does not look particularly appealing, my friends told me it was!! And finally a dessert was served to my friends with a complimentary glass of sweet wine. 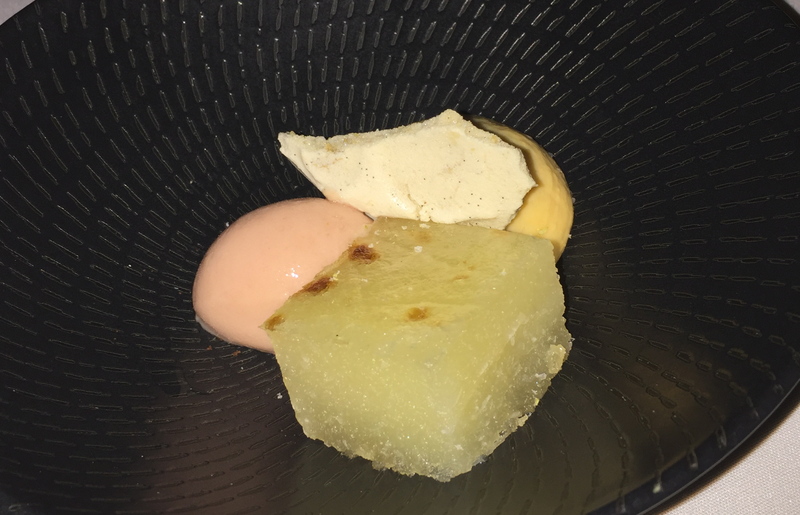 The dessert was two sorbet and a strange cube of jelly like substance; looked ok and said to be tasty, but I decided not to try it. A great night and I surely will return. 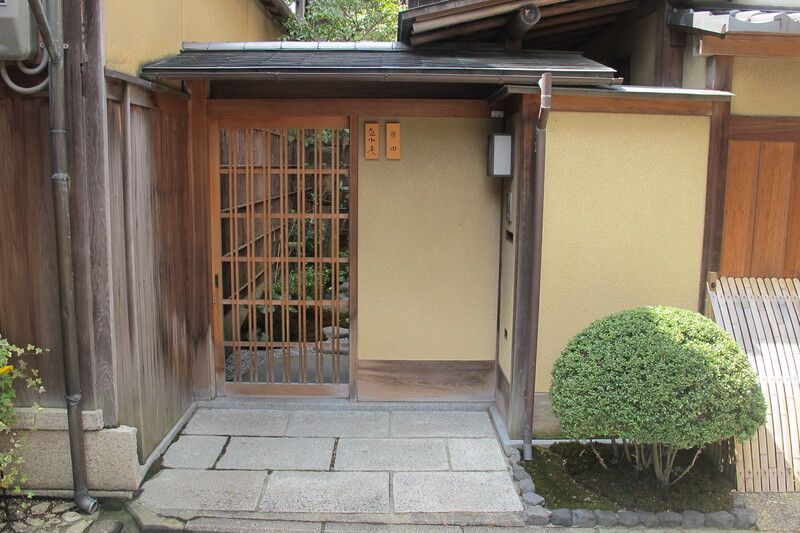 The temple at Ryoan-ji is a very popular site in Kyoto and said to be one of Japan’s better-known sights. 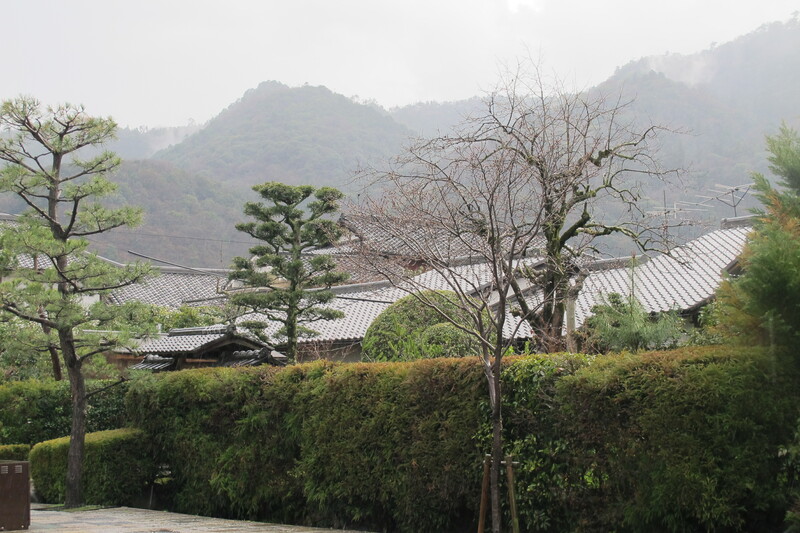 The temple was founded in 1450 and whilst the most popular area is the rock garden, there are other gardens to walk around with beautiful cherry blossoms and lakes to view. As I mentioned, the main attraction is the rock garden which is an oblong of sand with an austere collection of fifteen carefully placed rocks. They look like they are adrift in a sea of sand – all enclosed by an earthen wall. 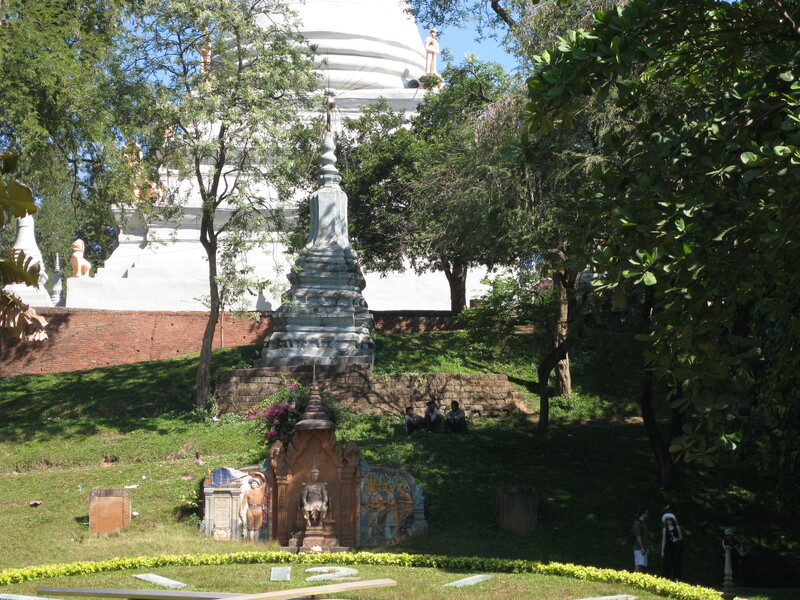 It’s a very serene place to visit and you really must go first thing in the morning as it is such a popular place that it’s difficult to get a good viewing point with all the visitors. 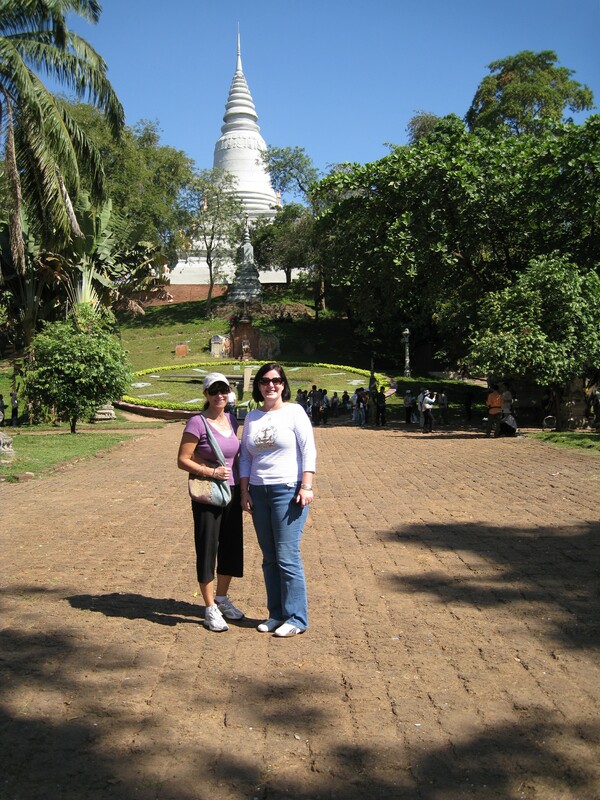 From memory we had to remove our shoes to enter the temple and sit around the rock garden. You can sit here and contemplate your life. 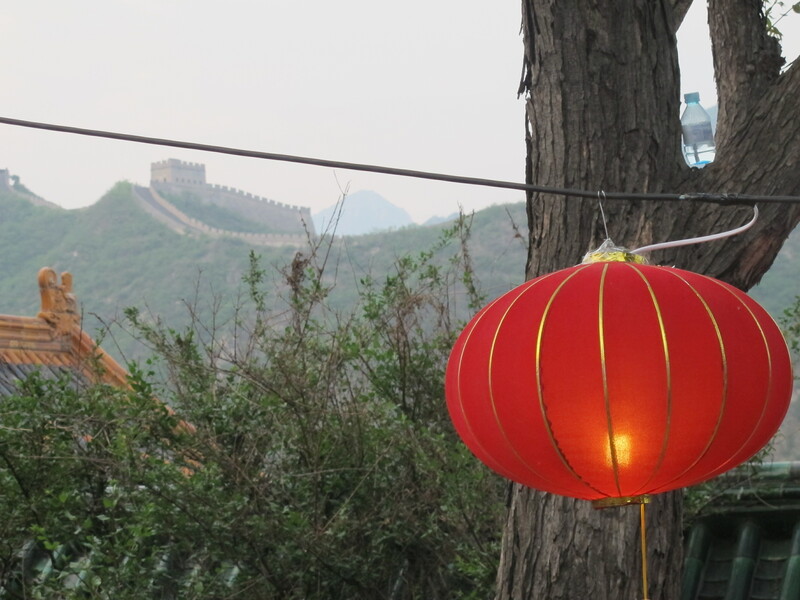 It really is lovely and so quiet (so different to my visits anywhere in China where it’s noise, noise and more noise – even when it’s supposed to be quiet). 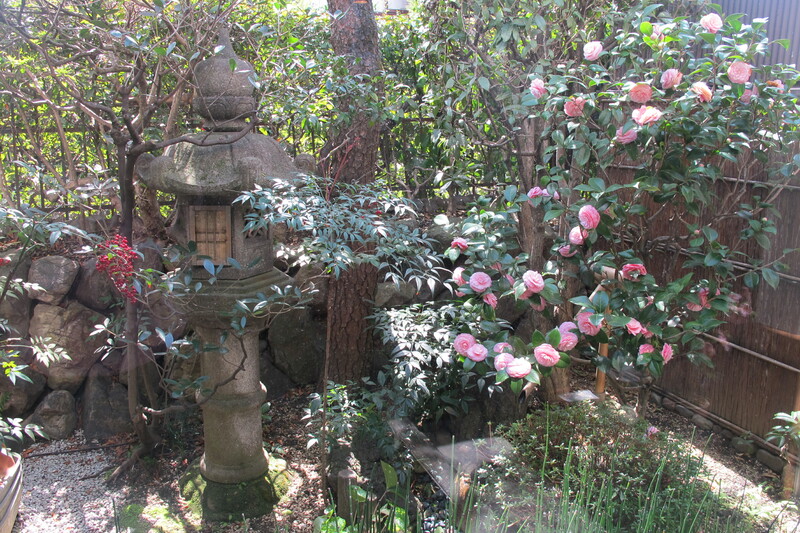 You take a seat on the wooden benches around one side of the garden and just relax and look and do not much else…simple, harmonious and very zen – it’s lovely!! 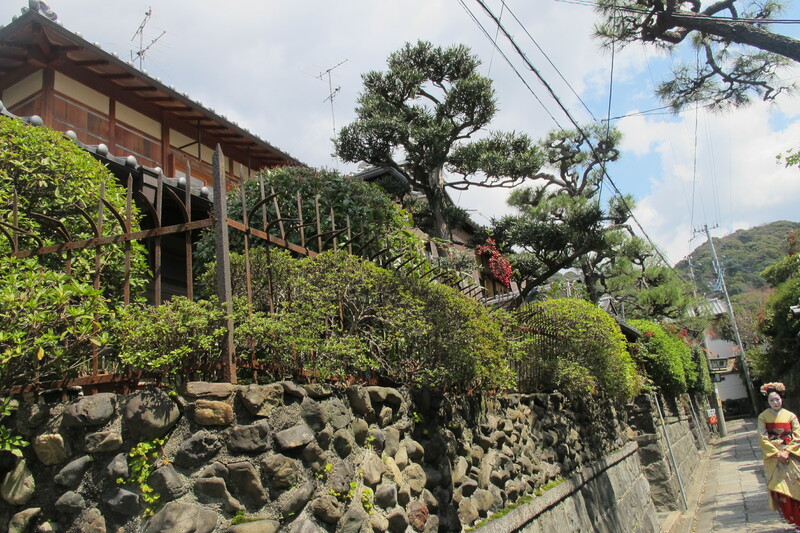 So this post will look at my week long visit to Kyoto in 2012…I had done a lot of research and wanted to visit a particular canal as it was renowned for its cherry blossoms which are growing along the river banks, outside beautiful Japanese houses. 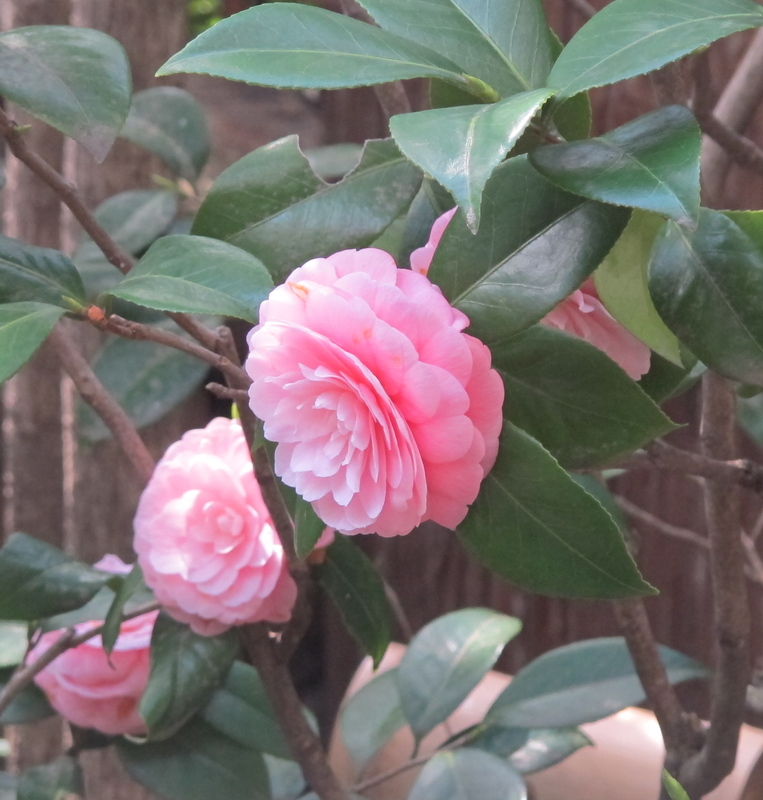 I was not disappointed – the blossoms were beautiful!! 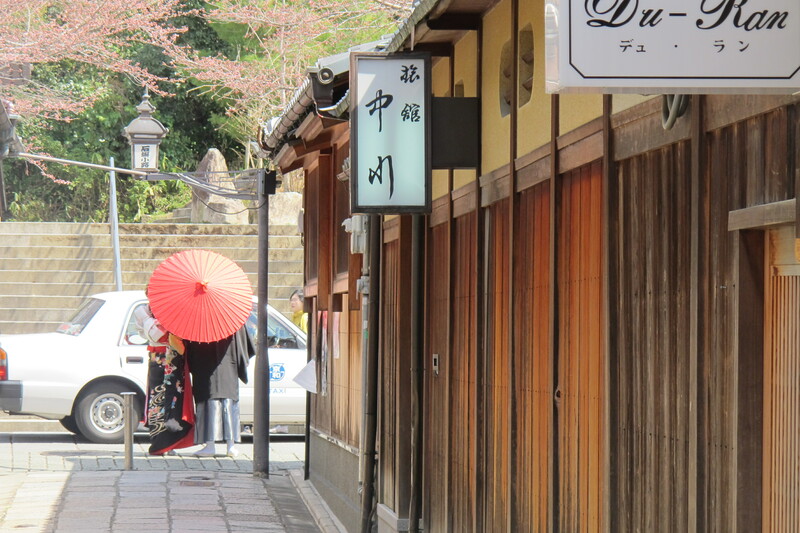 Sakura is the Japanese word for cherry blossoms and they could be one of the most beautiful things to see [ever] and Kyoto is definitely the place to see them. But not only did I see the amazing cherry blossom trees but was very fortunate to see two weddings. Both brides were dressed very differently and they certainly didn’t seem to mind me (and many others) taking photos. They looked so happy; smiling at each other and just enjoying their very special day. Cherry blossoms bloom between March and May each year and the internet provides a calendar of where in Japan the trees will blossom so if you are considering visiting, it is essential that you check out the dates the trees are blossoming and their location otherwise you may miss the blossoming as the trees blossom in different places at different times. It’s funny how many photos you can take of the cherry blossoms as they are so amazingly beautiful. The weddings were very special too. 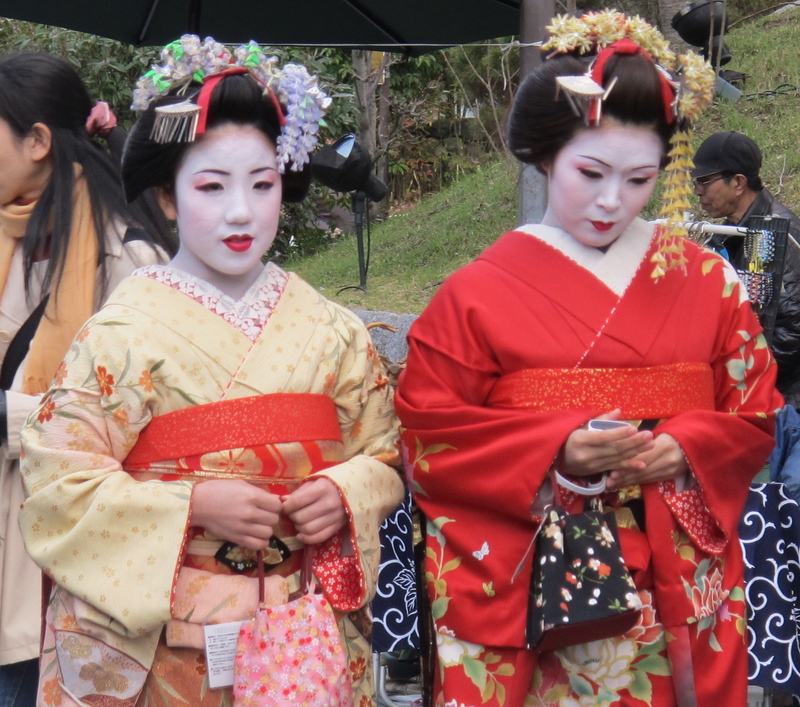 It was so lovely just walking along the canal and looking at the Japanese homes, the beautiful cherry blossoms and the grooms and brides dressed in their traditional Japanese clothes. One of my friends loves this restaurant and whenever she is up visiting from down the coast, she invites a few of us to join her for dinner. 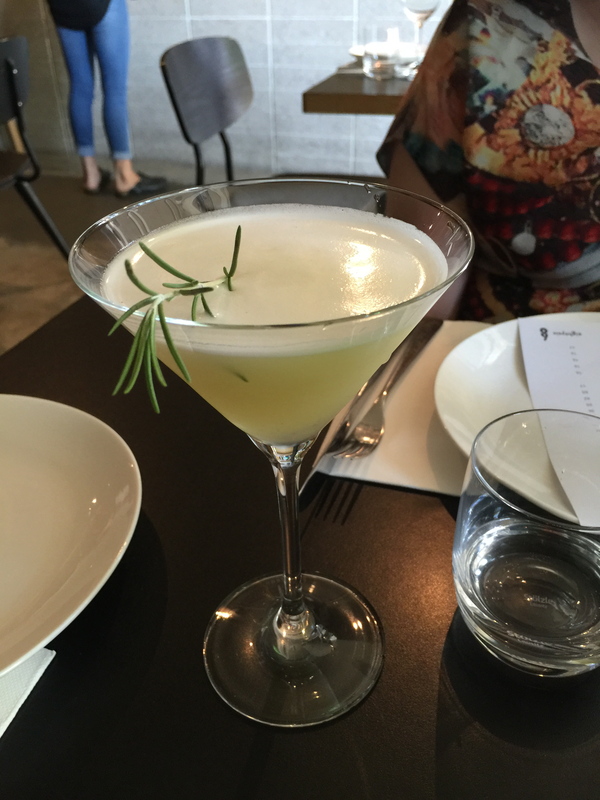 I drove to the restaurant which is only about ten minutes from my home and when my friend and I arrived, our two other friends were already seated and enjoying a martini so another round was ordered but I stuck with my usual glass of Sauvignon Blanc. 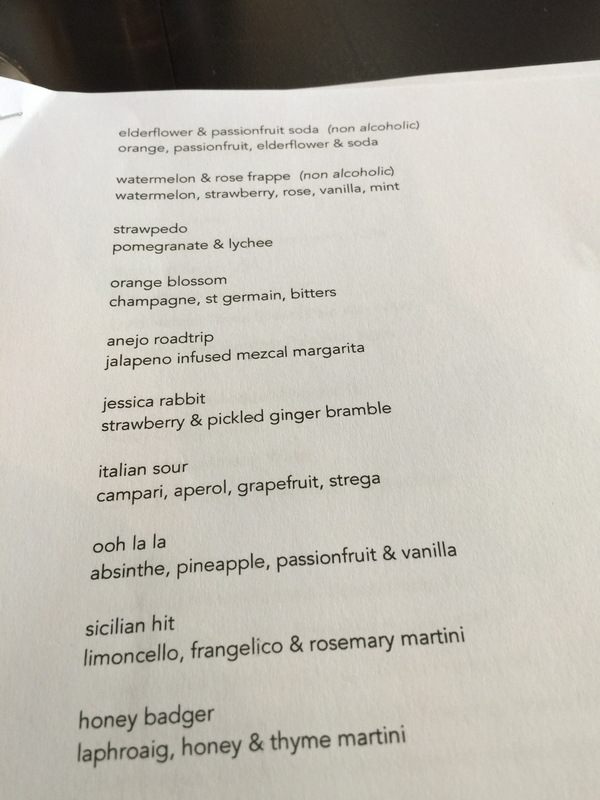 There is a really good menu of martinis along with non-alcoholic ‘mocktails’. 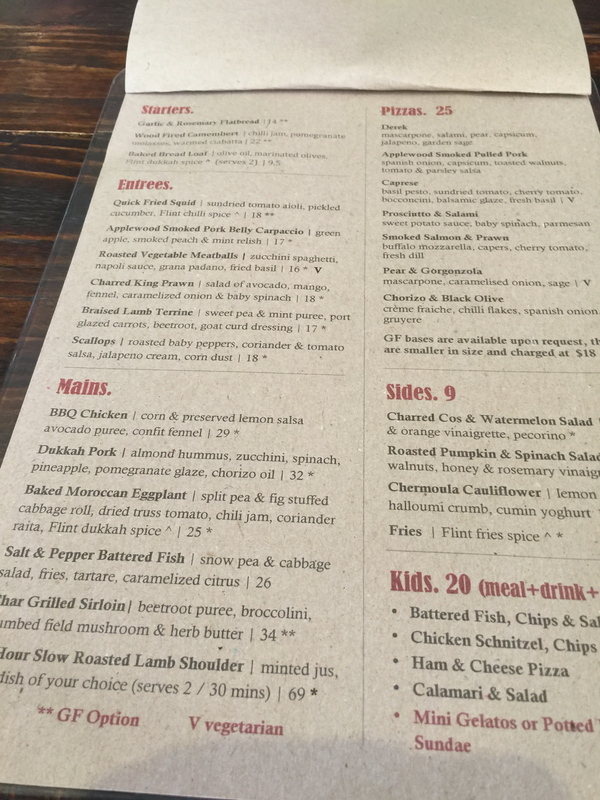 The food menu is scribbled along the back wall ready to be scratched out when the particular menu item is no longer available – this I was told is to ’86 ‘ something which means it is to have an item crossed off the menu. Since my last visit they now have paper menus which are easier to read as on my both visits I have sat with my back to the blackboard. The dishes at ’86’ are meant to be shared and I really only go to there to catch up with my visiting friend as there are not a lot of vegetarian dishes. My friends ordered the chicken liver parfait with jam and toast (not the jam and toast you have for breakfast!! )…they loved it. They also ordered the dry aged t-bone steak with salsa verde and béarnaise sauce [this is cut up into smaller pieces before it arrives at the table], the fried chicken pieces with hot sauce and the hoisin duck bun with pickled cucumber. By this time my friend’s husband had arrived so he ordered a cocktail and after a while another order of the chicken was made as I am told it was delicious. 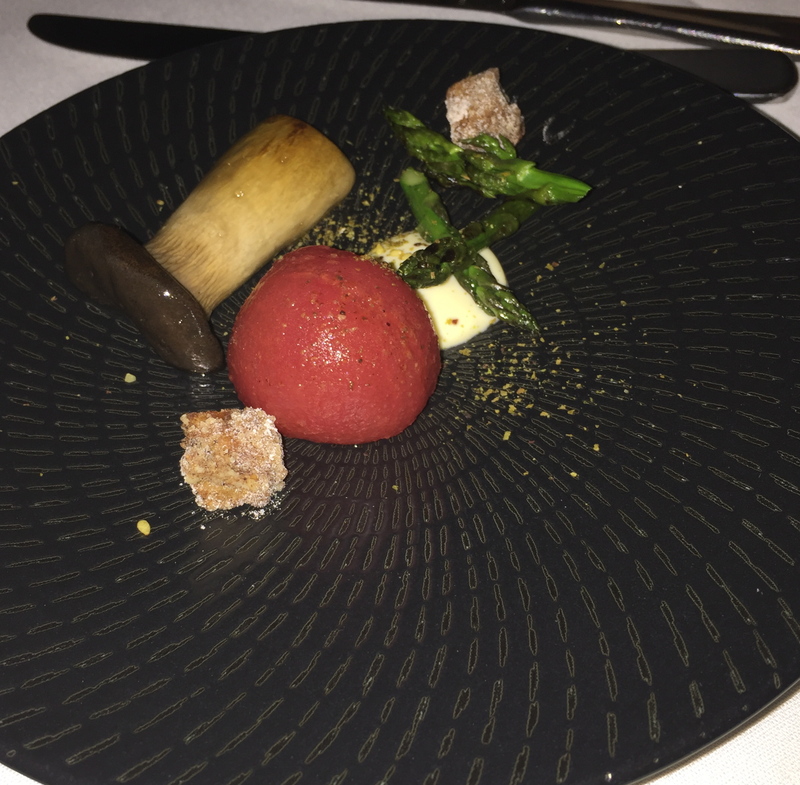 I ordered the lemon ricotta pumpkin gnocchi with asparagus and chèvre, the cauliflower with house yoghurt and pomegranate and the pea, lime and fennel salad…we all shared my vegetarian dishes and every one of us said the fennel salad was delicious. I love fennel and this salad with mint and leaves was so refreshing. 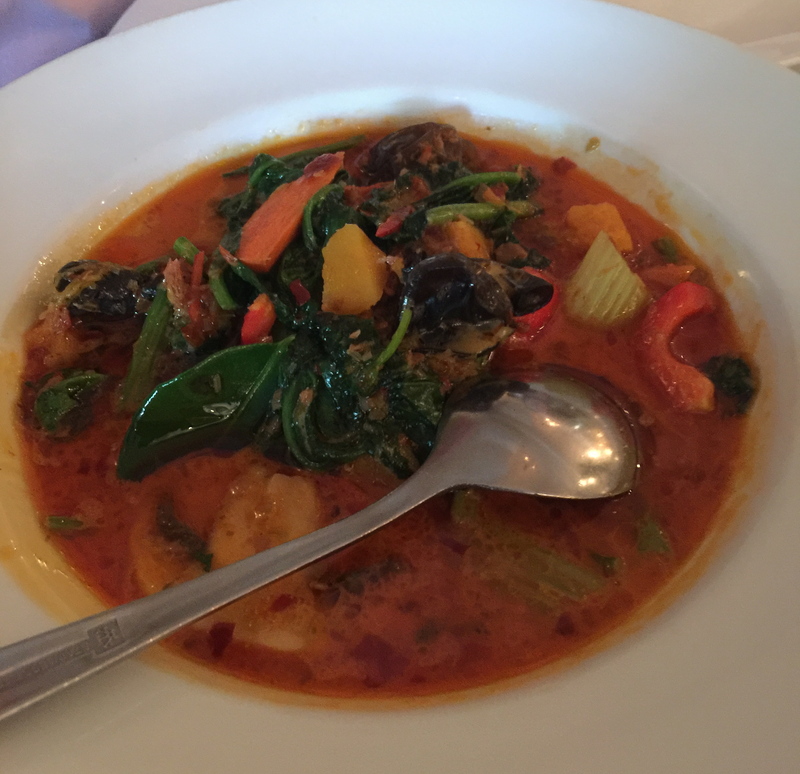 But both me and my visiting friend said the gnocchi was a little dry (seemed like it had been cooked a while before it was served and left out before coming to the table). 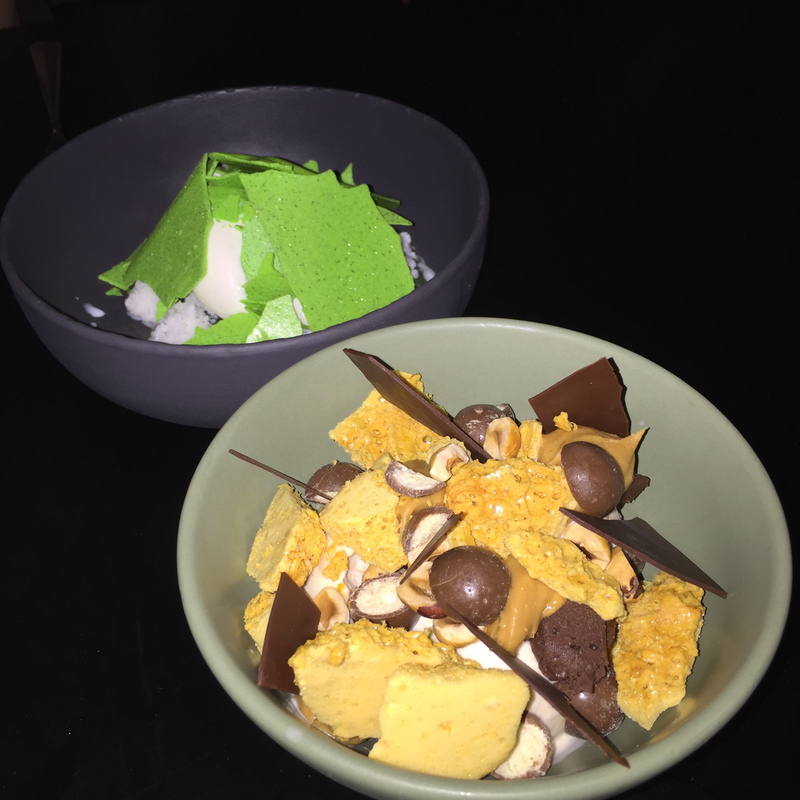 I was rather full by this stage but my friends decided to share a couple of desserts; a chocolate ice-cream dish with maltesers and honeycomb and another dish which was based on cucumber. 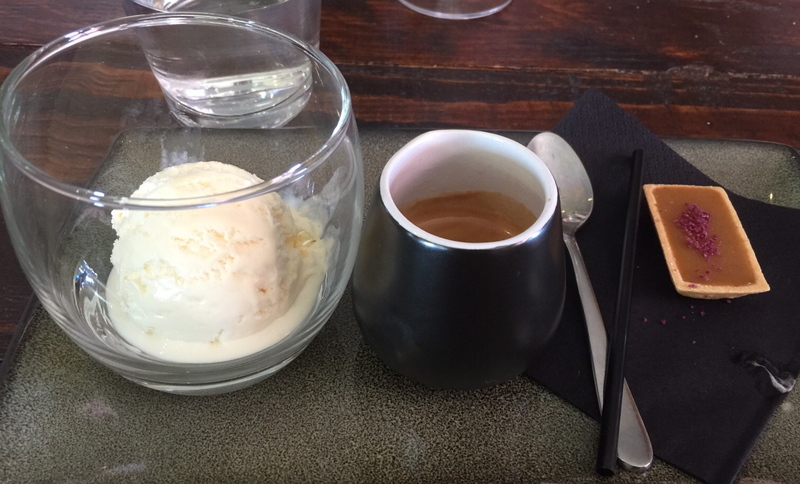 I would never have ordered this but when it came out I did taste a little and it was really nice. Who would have thought a dessert made with cucumber would be lovely. 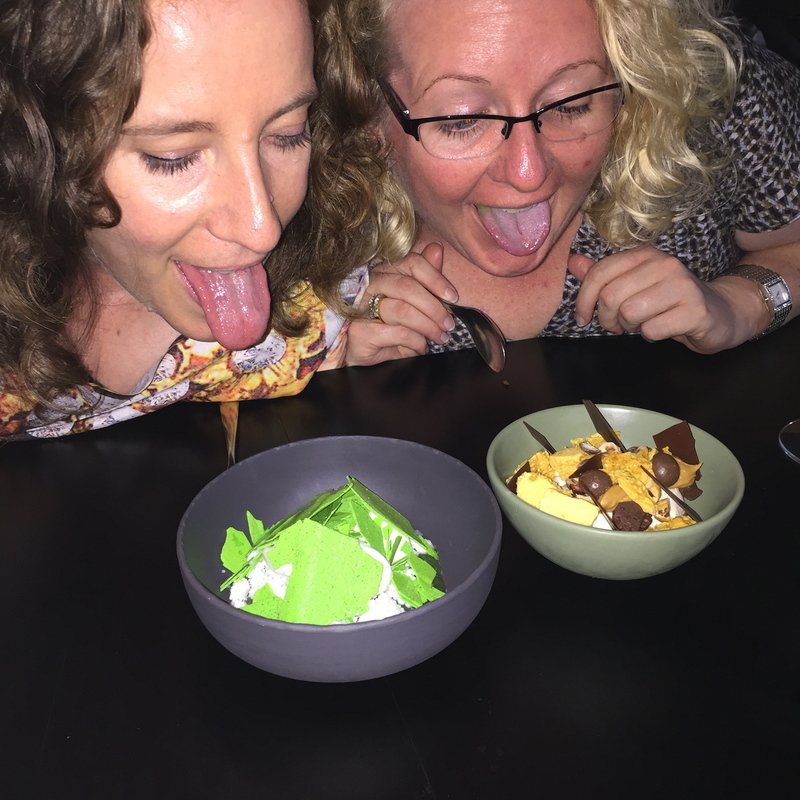 My friends decided to pull funny faces for me to post…(probably one too many cocktails!!). 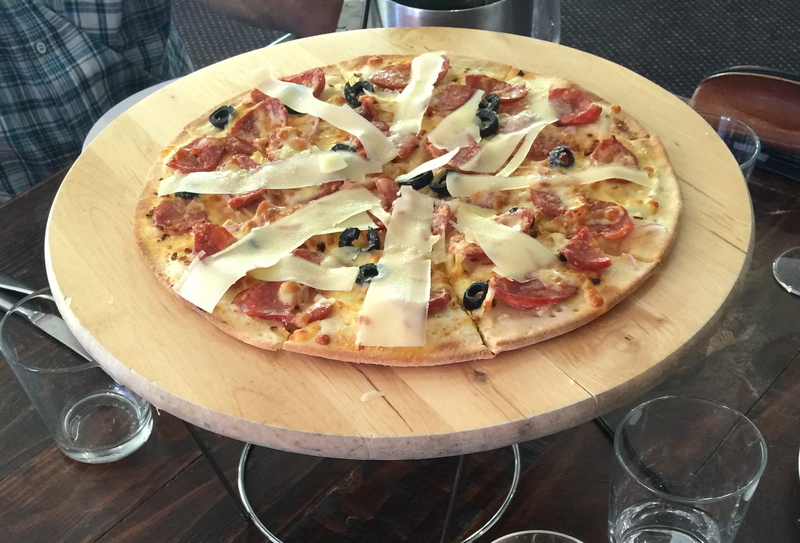 A couple of weeks ago I organised for a group of friends to have lunch at a local winery which is about a thirty-minute drive out of Canberra. 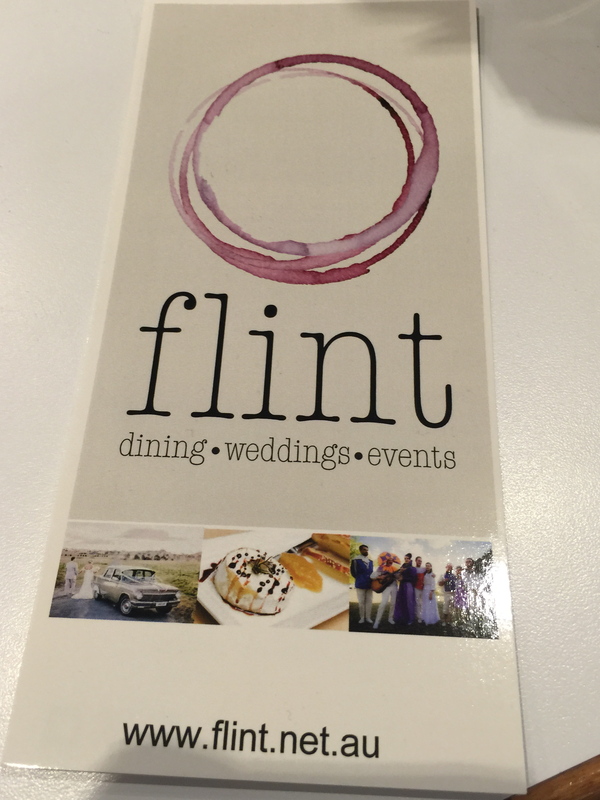 When we arrived, our table was not ready so we stood at the bar and partook in a wine tasting; well not me as I was driving but my friends tasted every one of the wines available. All were not that impressed with the wines really, apart from the Riesling which some friends liked the sweet and others (like me as I had a glass at the table) thought the non-sweet Riesling was ok. 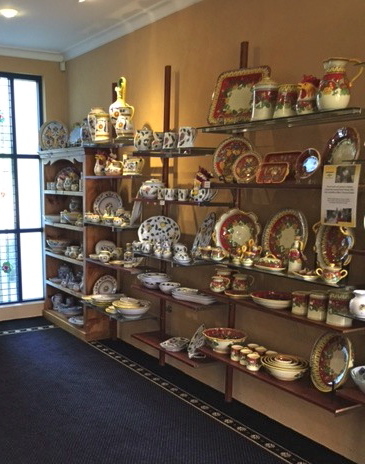 There is also a huge range of pottery to buy and olive oils/dukkah/balsamic vinegar and jams…on this occasion I didn’t buy anything but have bought some olive oil in the past. It was a very busy day for the restaurant so we were seated about half an hour over our reservation time – more time for my friends to taste the wines. 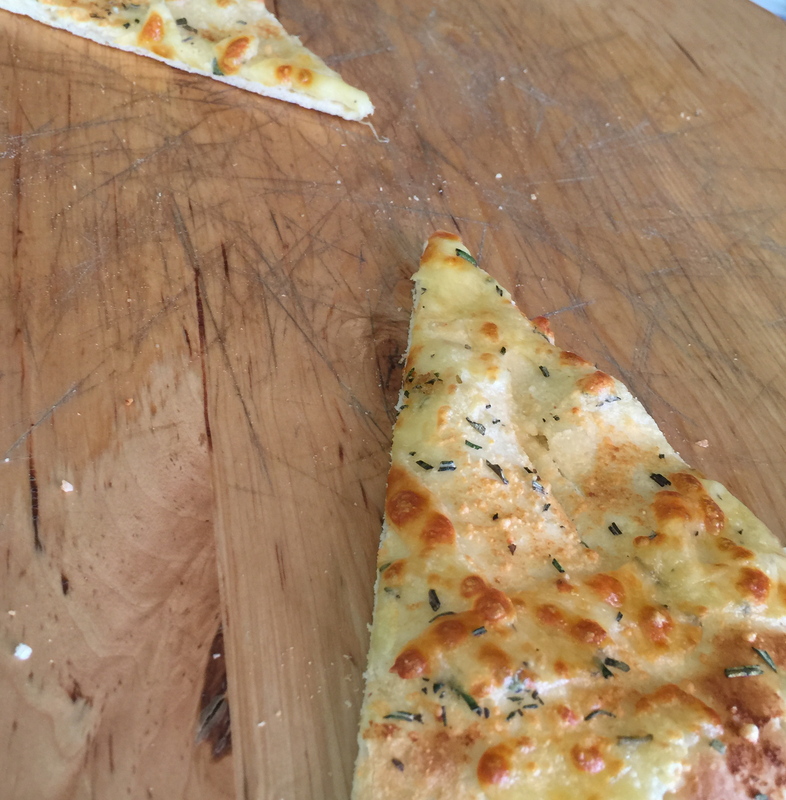 We ordered a range of dishes as our main course but started off with the pizza bread; which was very nice topped with rosemary…I forgot to take a photo until it was nearly all gone. One of my lovely (and dear) friends [Nat] who reads my blog religiously, kindly reminded me to take the photo. 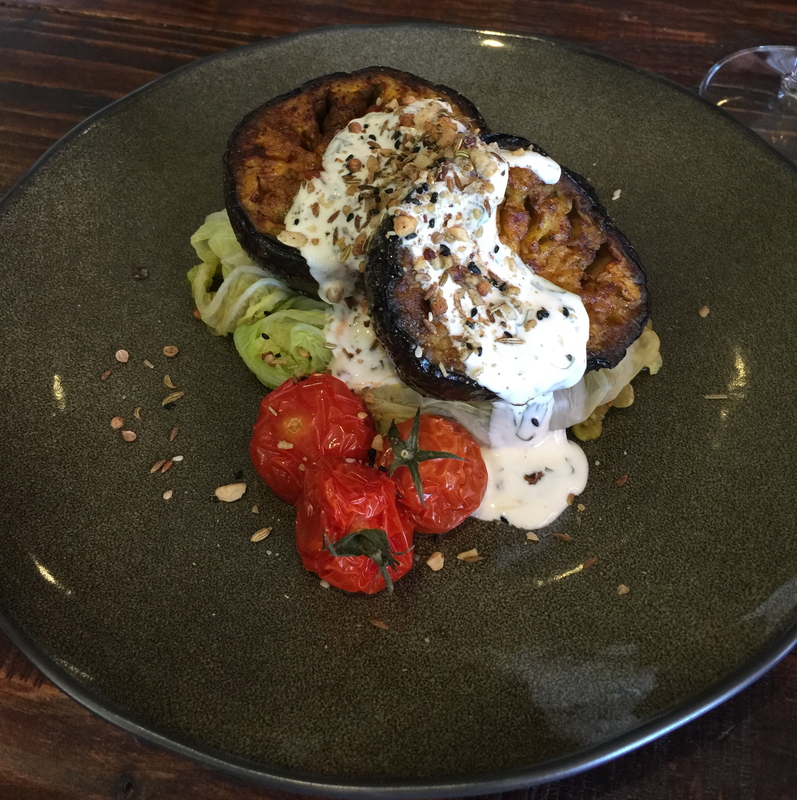 I ordered the baked Moroccan eggplant with split pea and fig stuffed cabbage roll, dried truss tomato, chilli jam, coriander riata and dukkah spice….I loved the eggplant but didn’t really love the stuffed cabbage roll, it seemed a bit soggy – so I didn’t eat any more than one bite. But the dish looked fabulous with all the vibrant colours on the plate. 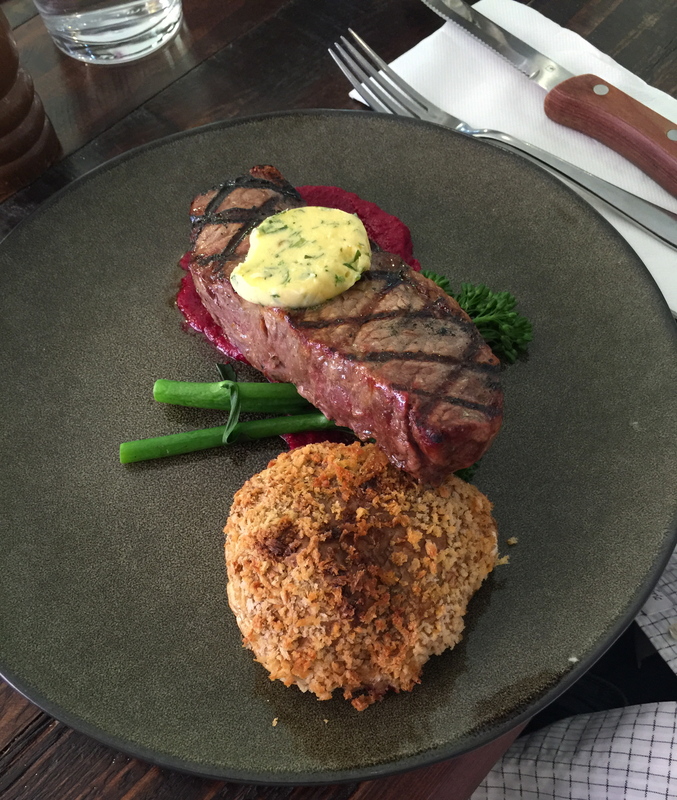 Some of my friends shared a pizza and a couple of others ordered the salt and pepper battered fish, the char grilled sirloin with beetroot puree and crumbed herb mushroom with herb butter. 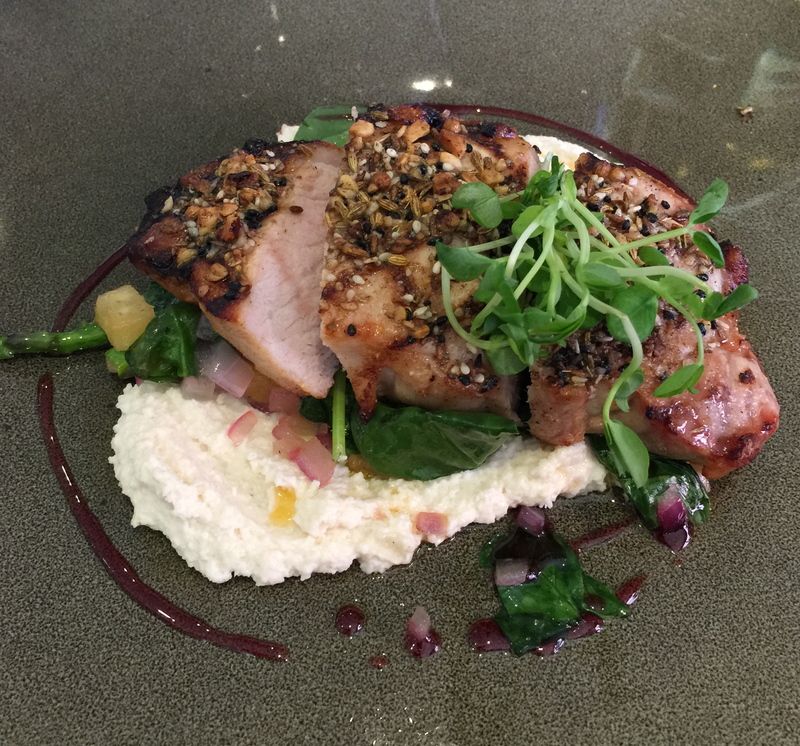 One other ordered the dukkah pork with the almond humus, zucchini, spinach with pomegranate glaze and chorizo oil. 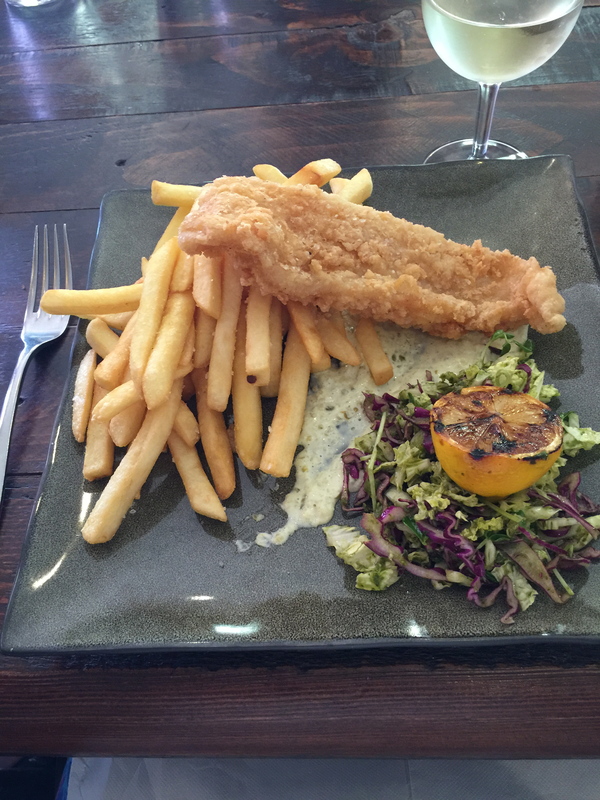 All the meals were aesthetically pleasing and everyone enjoyed their dishes which were really plentiful…so much that none of us ordered dessert…this was probably because we ordered two bowls of fries – which had some sort of salt/herbs on them – delicious! 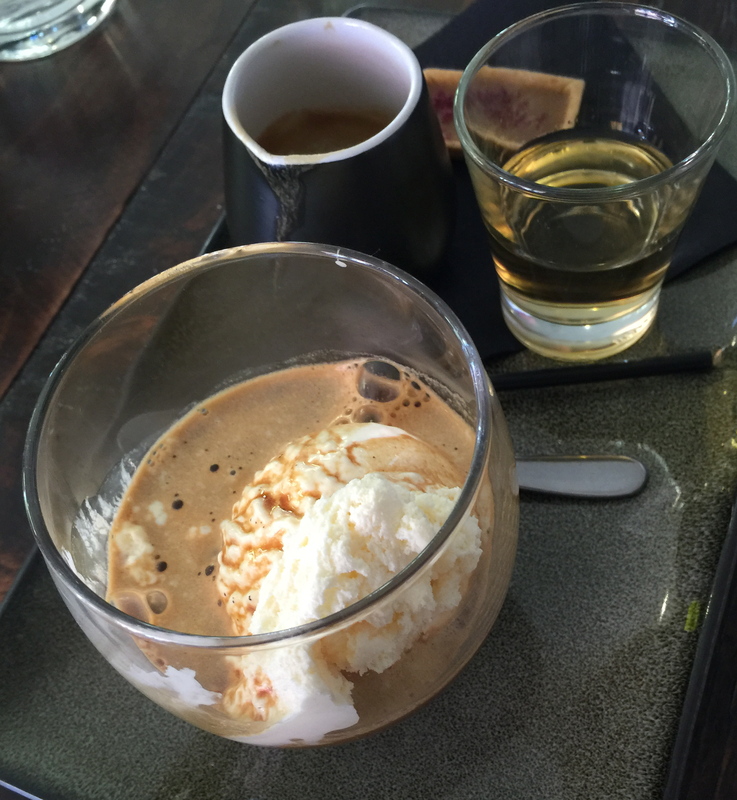 But some of the group did have a little space left to eat/drink the coffee and liqueur with ice cream (I think it’s called Affogato)..
All in all a really nice afternoon to catch up with friends over good food. 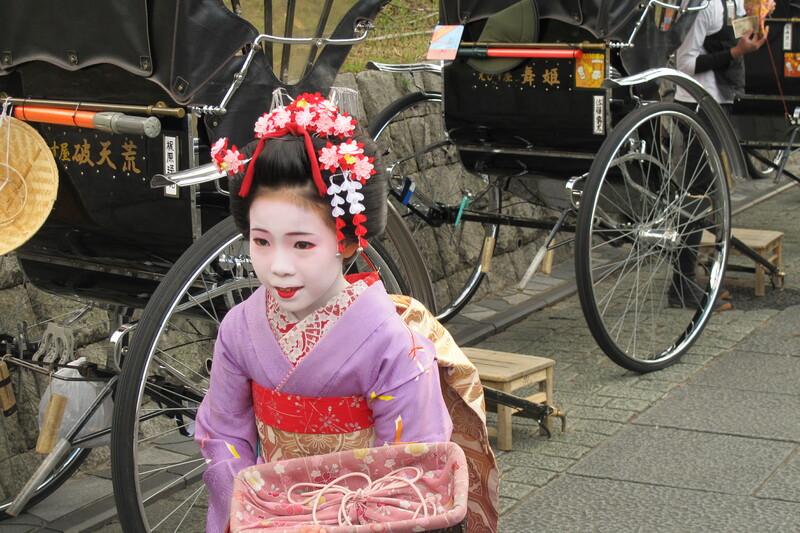 Whilst I was working in Beijing, I made a week-long trip to Kyoto in Japan as I had heard from everyone I spoke to, that Kyoto was a beautiful part of Japan, and of course there are the cherry blossom trees and Geisha to see. 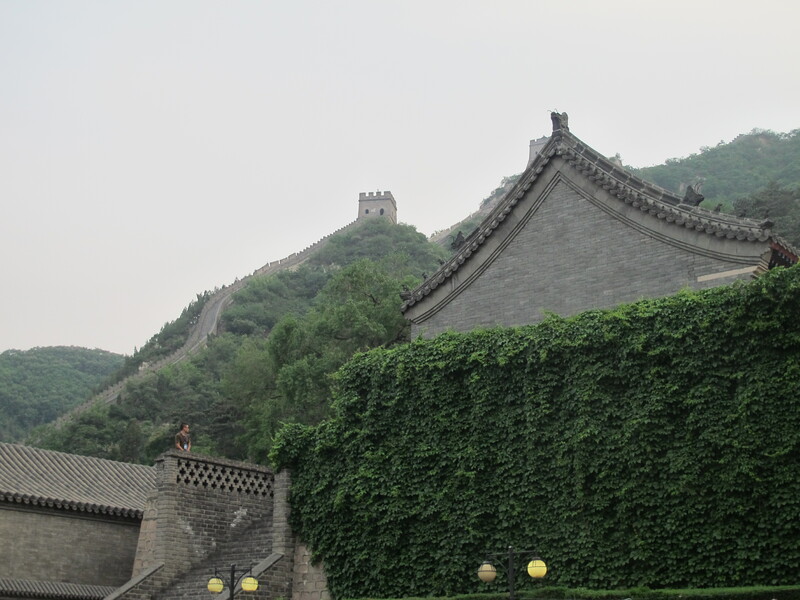 I looked up the best time to visit when the cherry blossoms were in bloom and with a friend, we departed Beijing. 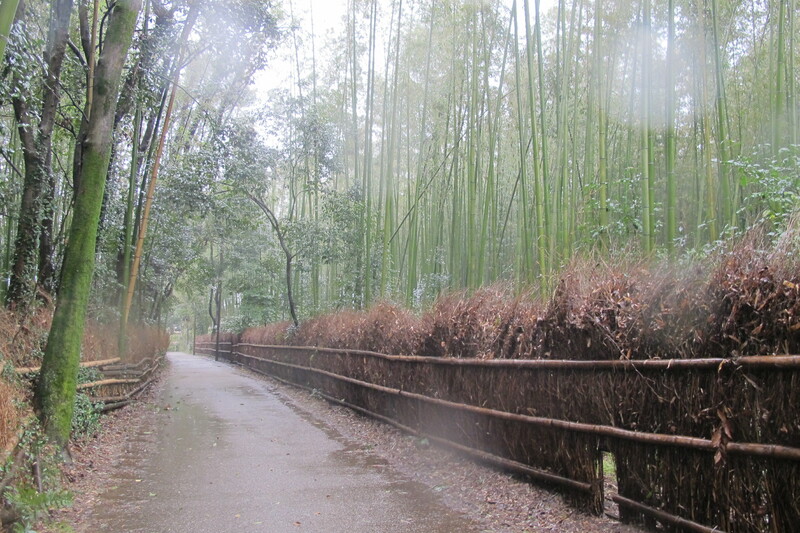 I visited many places and intend to post on all my visits, but today my post is on my visit to the Arashiyama Bamboo Grove. 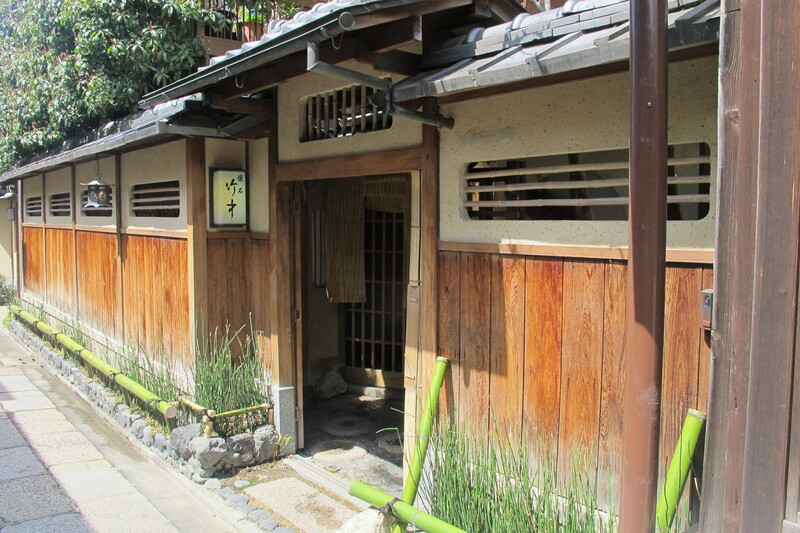 I loved Kyoto – it was absolutely gorgeous!! And people were so lovely; albeit hardly any spoke English and I do not speak Japanese (but we managed – hand gestures work really well). 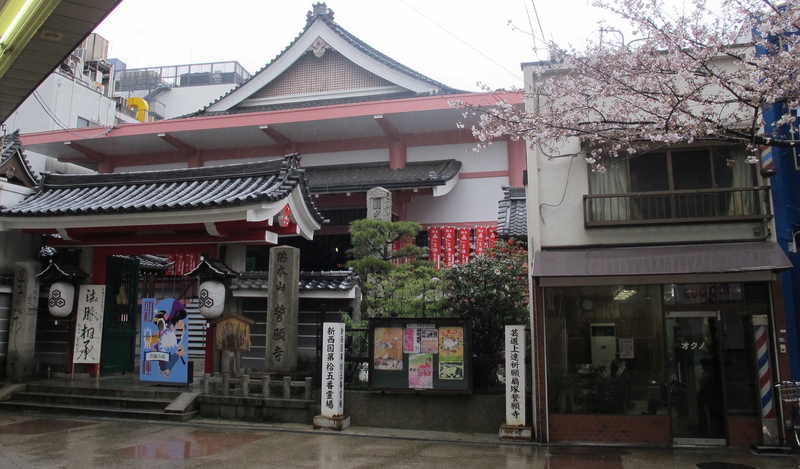 We flew on Air China from Beijing and then pre-arranged transport on the airport shuttle to our hotel (Toyoko Inn Kyoto Shijo-Karasuma), which was very small and not a hotel room you would want to spend much time in but it was ok! 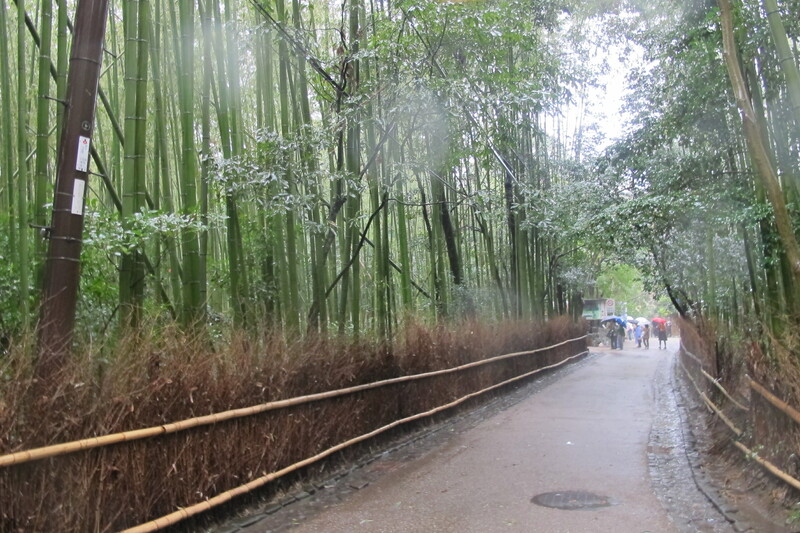 Bamboo Grove is one of Kyoto’s most famous sites and said to be very similar to the bamboo forest in the film ‘crouching tiger hidden dragon‘. I have watched the movie and do agree (fabulous movie). 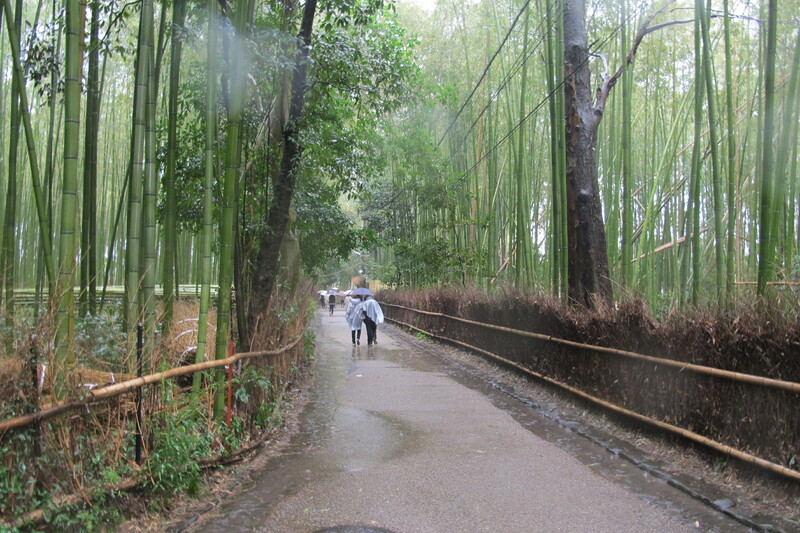 The grove is very popular with Japanese tourists especially in the cherry blossom festival time, as like everywhere in Kyoto, there are many cherry blossom trees, but I was lucky as it was a very wet day, and there were not ‘that’ many tourists. 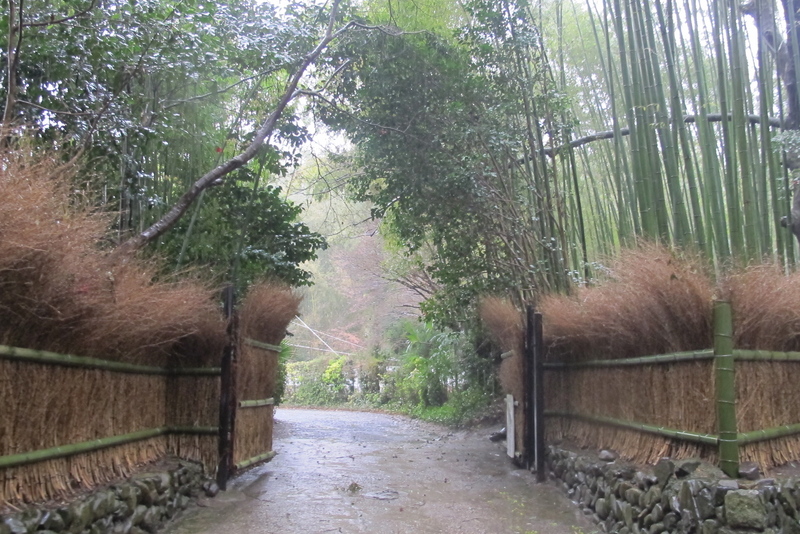 I think the rain made the visit even more wonderful as the rain drops were falling on the bamboo which looked just lovely. 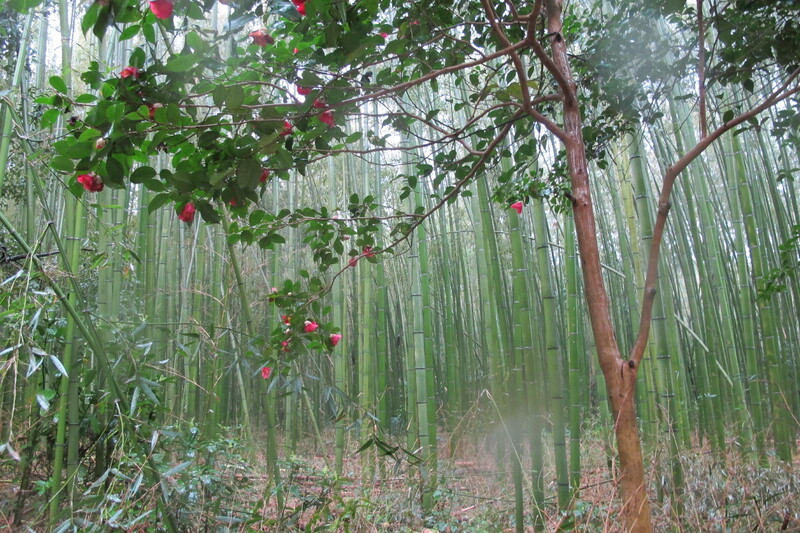 The bamboo is spectacular and it’s lovely walking through the paths with incredibly high bamboo surrounding you. 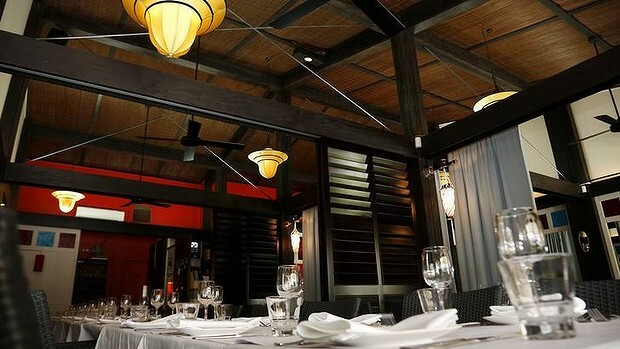 Canberra has a wonderful Cantonese cuisine restaurant that is very popular with both locals and visitors. 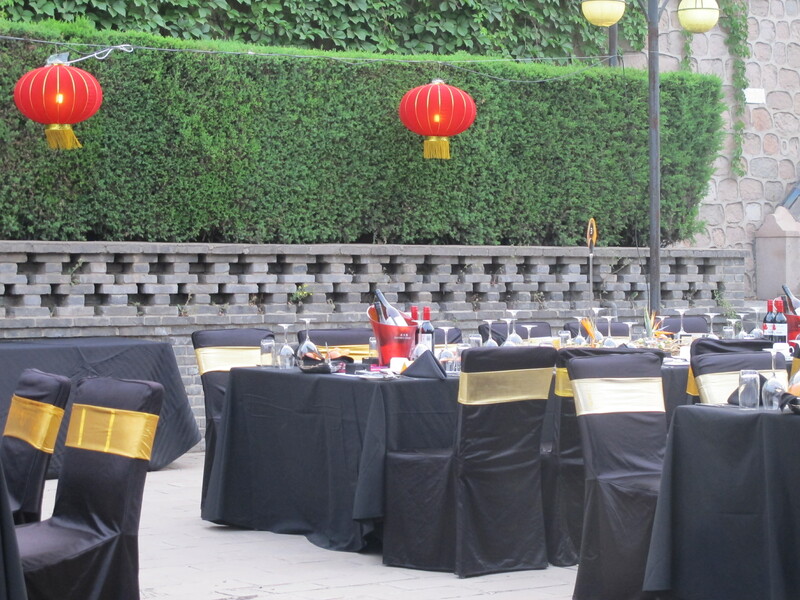 It’s located in the centre of the city and I arranged an evening with a group of friends there recently as I had not been there for about fifteen years. 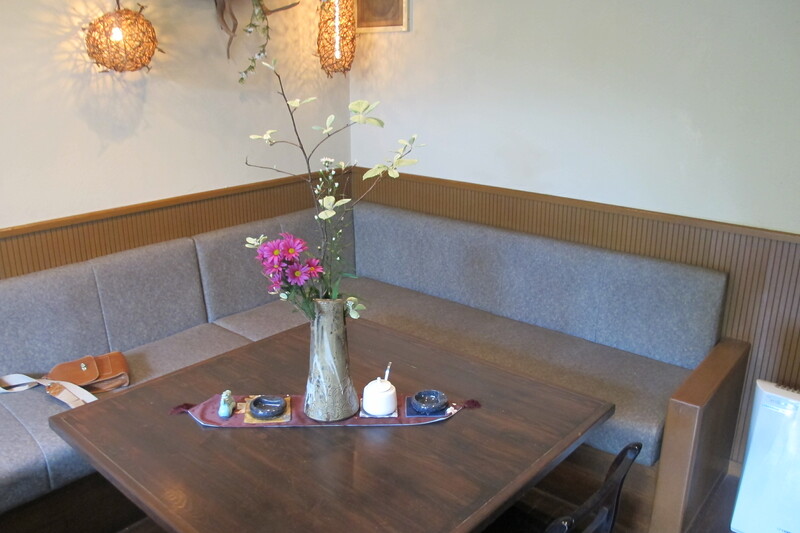 There is an extensive menu with many vegetarian options. My friends ordered two duck pancakes for entree which they shared; and whilst I could have ordered the vegetarian pancakes I decided to wait for my main meal. The duck pancakes came served with hoisin sauce and I am told they were very good. I ordered the stir fried pumpkin with cucumber and caramelised chilli onion and mentioned to the waitress that I didn’t want any fish sauce etc in my meal and luckily I did as the chef uses shrimp sauce so he kindly removed that from my meal. 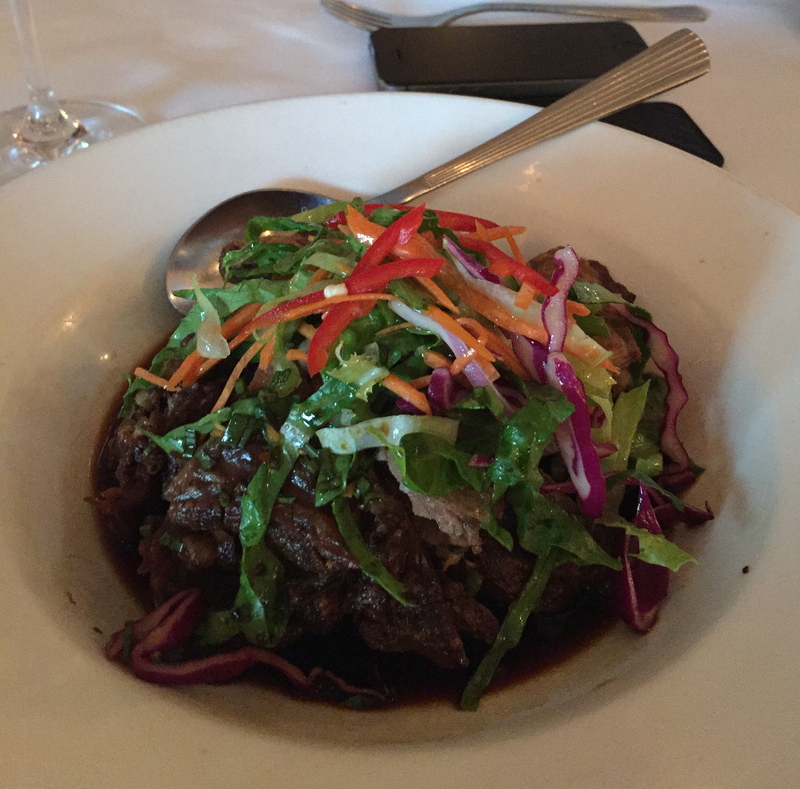 The dish was absolutely delicious!! My photo does not really do it justice as there was a wonderful chilli onion sauce which was delicious with a little bit of rice. One of my friends ordered the vegetarian curry and the other two the shantung style spicy lamb. All said their dishes were just fabulous. 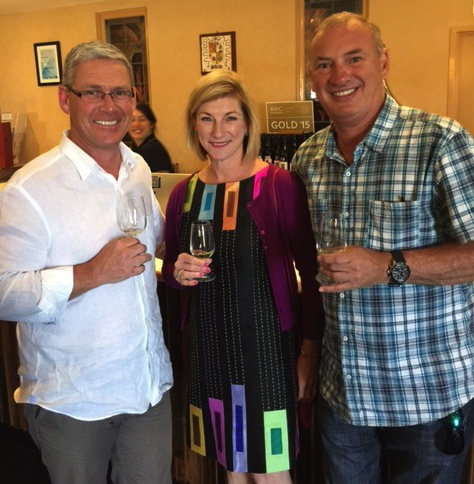 We all had a great night; sharing a bottle of wonderful New Zealand Sauvignon Blanc between us and the two boys enjoying a beer as well. Not much wine this evening as we were rather tired and each of us was driving home. We finished around 8.15 pm, which was early as it was Friday but at the end of a busy week it was good to get home early. 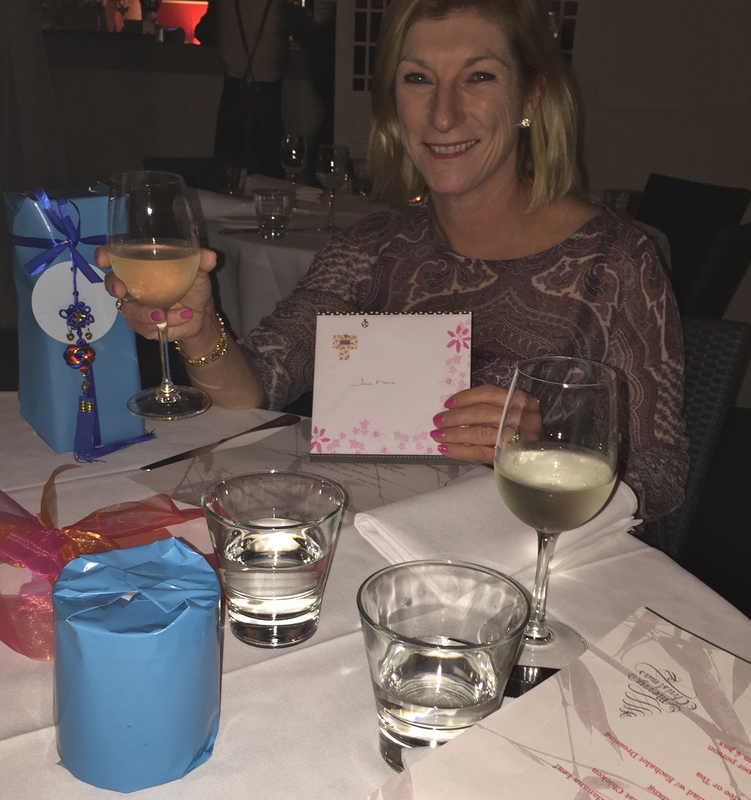 It’s always lovely to catch up with friends over a great meal and glass of wine and I know sometimes we just want to get home after a week of work but to make the effort is really important otherwise we never catch up.